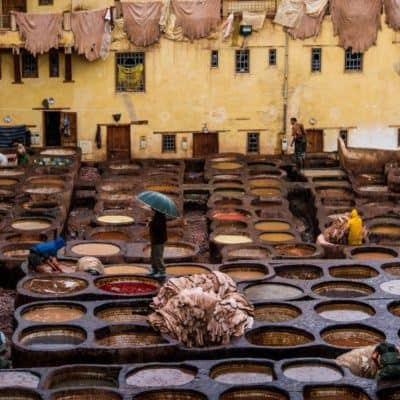 Is Tangier worth visiting? 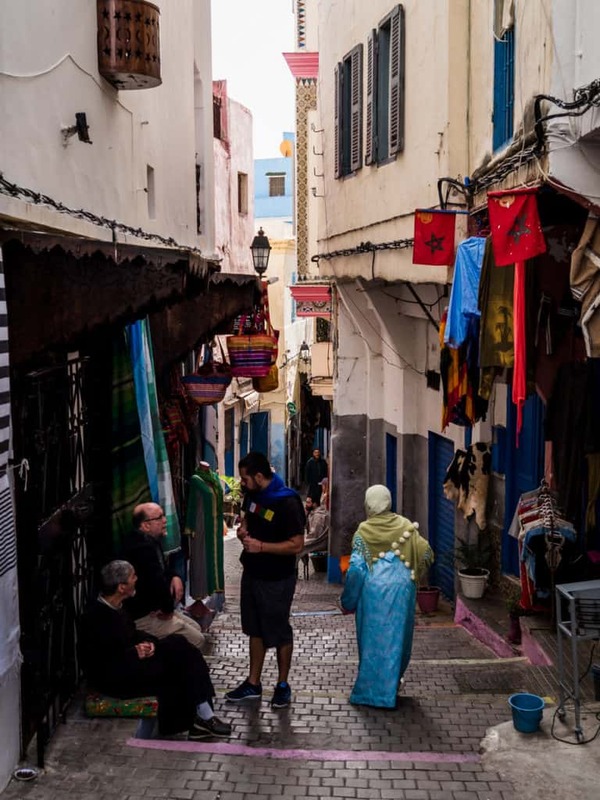 What can you see and do in Tangier? 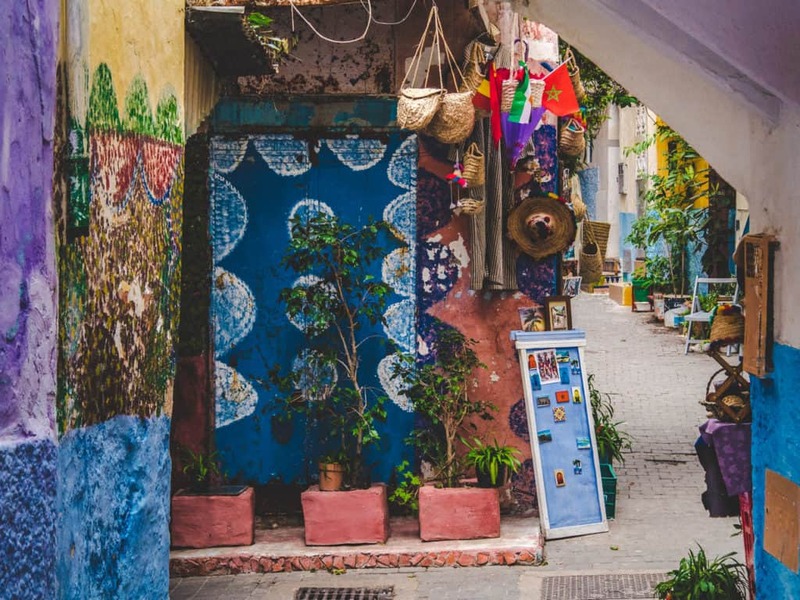 In this in-depth city guide, you’ll find an overview of the most interesting places to visit in Tangier, recommendations about where to stay and where to eat and information about how to get around the city. Ever since I first came to Tangier, this city has never stopped fascinating me. I lived there for 6 months and it’s still to this day one of my favorite cities in the world. It has everything I ever wanted from a city: a sense of exotic mystery, the most interesting history, beautiful sights, and unspoiled beaches. On top of that, Tangier is an uncontrolled mix of North Africa, Spain, Portugal and France, the ideal melting pot for my culture hungry mind. Each day ferries cross the Strait of Gibraltar to this city from Europe, making it one of the most cosmopolitan cities in Africa. 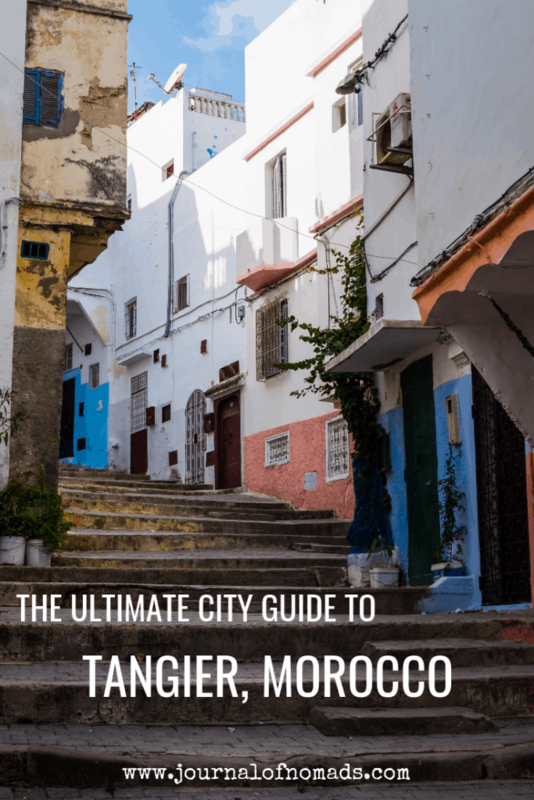 Together with my friend, blogger and dancer, Ruby Josephine , who has spent the last 5 years living in this North Moroccan city, we created the Ultimate City Guide to Tangier. 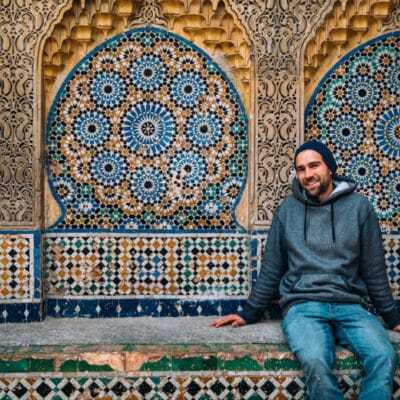 In this guide, you’ll read about the best places to visit and things to do in the city, the best restaurants of Tangier, the best hostels and riads,how to get around, etc. 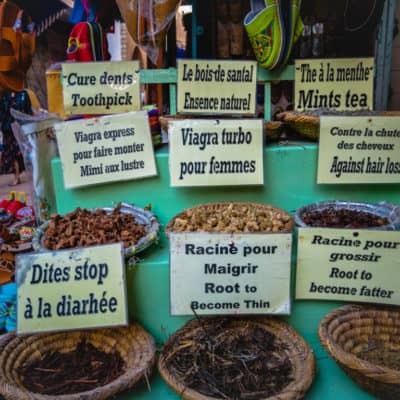 Planning a trip to Morocco soon? You can easily spend a few days in Tangier without getting bored. There are a lot of cultural, historical and colorful sites to visit. Ruby and I have both been living in Tangier, giving us the opportunity to know the city in-depth. 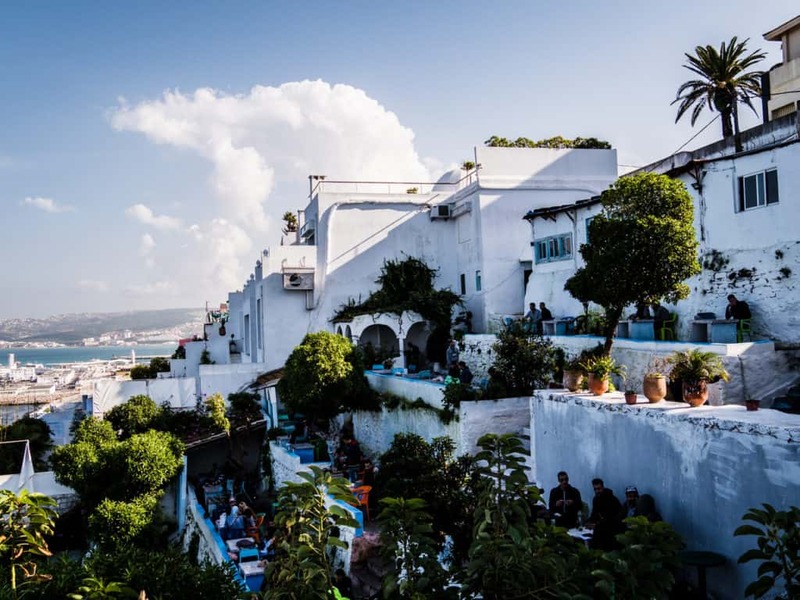 Here are our recommendations and suggestions of what you can see and do in Tangier, including some city tours and day trips from Tangier. Here’s an overview of things to do and places to visit in the city. If you follow the map below, you can easily tackle all the places in one day. 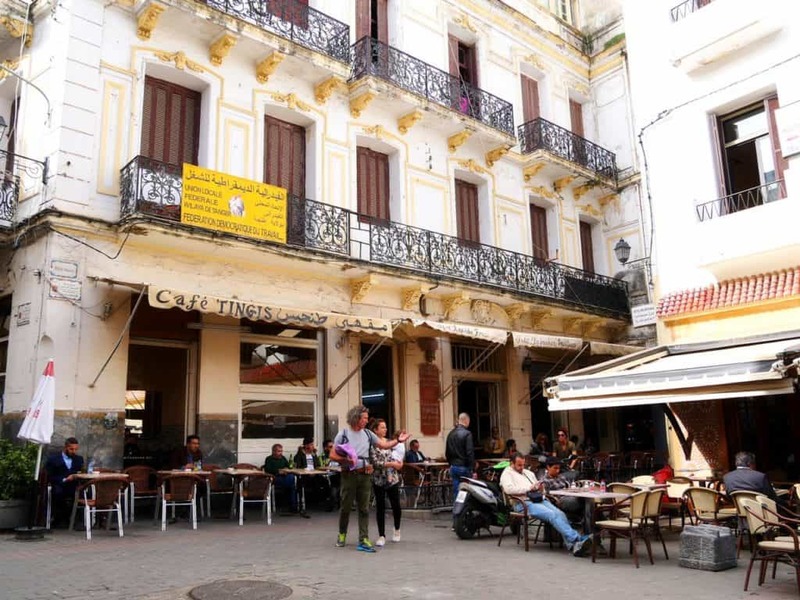 Cafe Hafa is practically an institution of historical Tangier and is a must-see for anyone passing through. 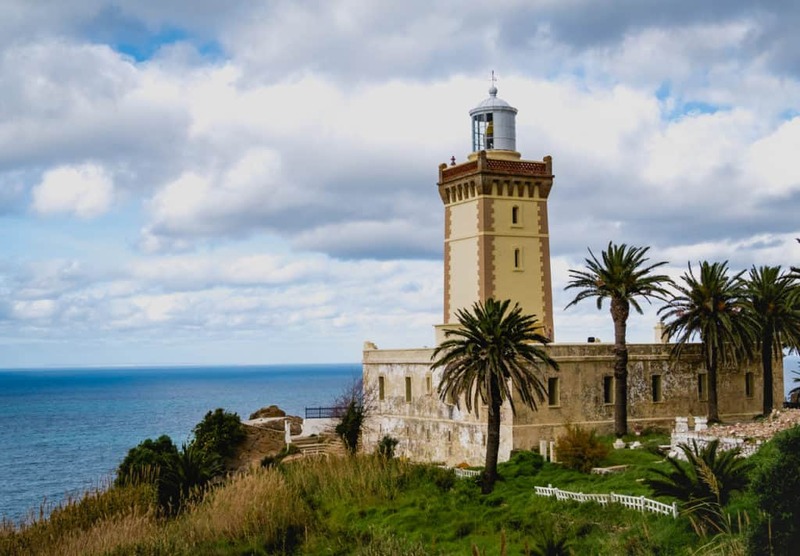 It has existed since 1921, as it so proudly proclaims at its entrance, and resides on a cliffside with a stunning panorama of the Mediterranean sea. This outdoor cafe is almost always packed in the afternoons with locals and tourists playing music, cards, and sprawling out across the tables. If you prefer to go while it is quieter, the mornings are the way to go. Either way, it is always the perfect place to have a traditional sugary sweet Moroccan mint tea and relax as you enjoy one of the best views in the city. Being one of the cheapest teas in town, a full glass costs only 7-10 dirham. While it is not a restaurant, you can order a steaming bowl of bissara, a Moroccan soup made of fava beans and split peas topped with olive oil and cumin. For an afternoon snack, my friends and I often buy pastries at bakeries along the way and bring them to eat with our tea. There are also old men wandering around the cafe selling salted almonds and peanuts for a couple dirhams a handful. The cafe is located in the heart of Merchan, a more residential area on a hill just above the Kasbah, at the end of Rue Hafa. To get there you can take a petit taxi and tell them simply that you would like to go to Cafe Hafa- everyone in town knows it. You can also walk, depending on where you are coming from. It’s a lovely stroll through a calm neighborhood, but be warned that it is mostly uphill. 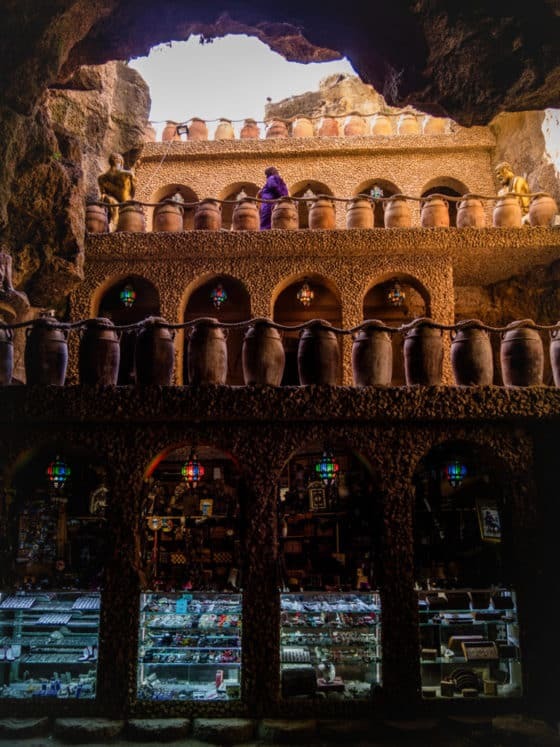 The Phoenician tombs are located between Cafe Hafa and the top entrance to the Old Kasbah. It’s true that these tomb structures are very often filled with water and litter, but they are still interesting and of great historic value. 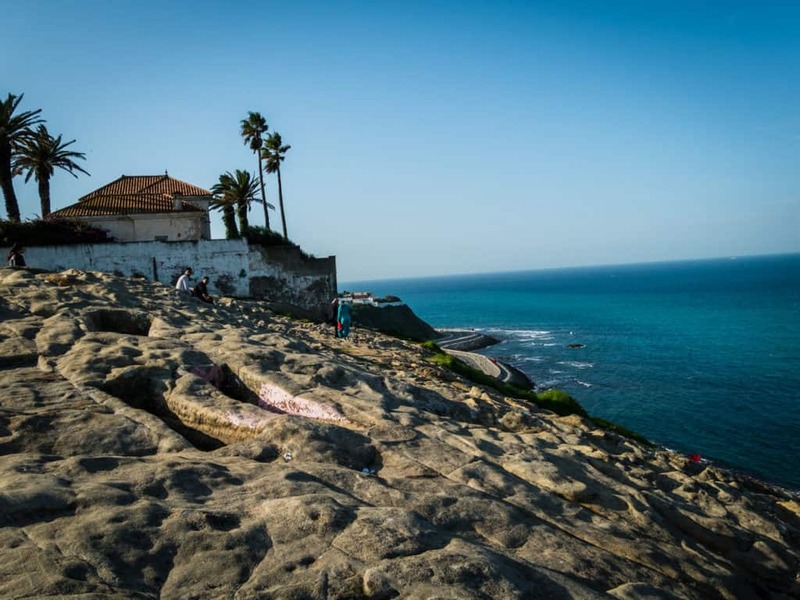 The top of the cliff where the tombs are located offers fantastic views over the city and the harbor. This is a place where the locals go to relax so if you have time, go there at sunset, take some drinks and snacks and sit down for a while. On a sunny day, you can see Tarifa in Spain. 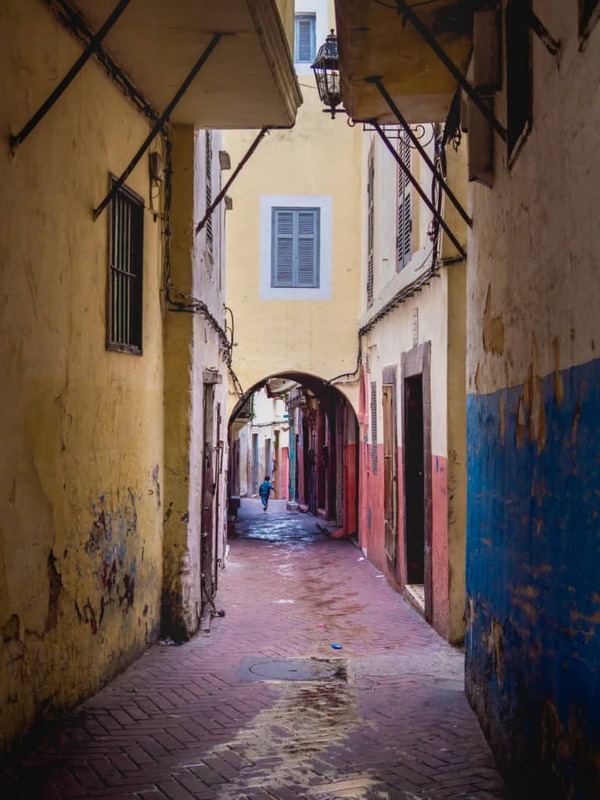 Getting lost in the old city is an absolute must when visiting Tangier! What is so interesting about the old medina is the miles and miles of tiny, narrow, endless paths in between the buildings where one can get lost in no time. Wandering the narrow streets of the medina used to be my favorite pastime when I was living in Tangier and I would absolutely suggest it if you want to get a real feel of the city. It can be confusing and sometimes overwhelming but it’s part of the adventure. Walking randomly in any old town is always an enjoyable experience. 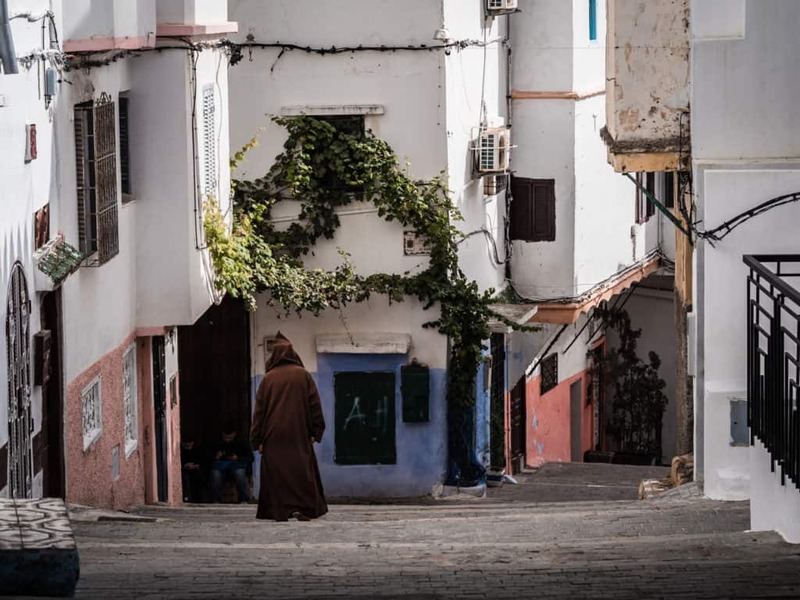 I walked in the medina of Tangier almost on a daily basis while I was living there. 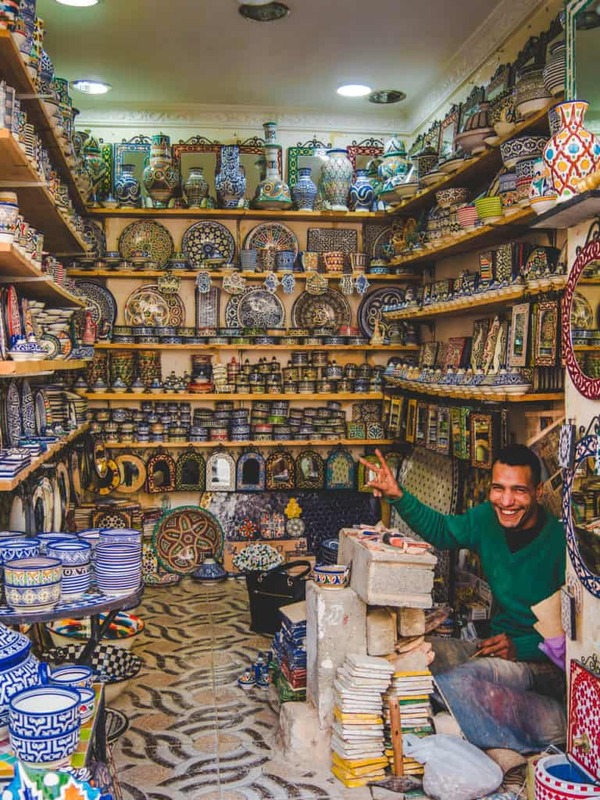 It’s clean and there is practically no harassment from sellers as in other Moroccan cities, like Marrakesh. It’s located right on one side of the Grand Socco and about 3 km from the train station. It’s also the place where most of the hostels and riads are located. 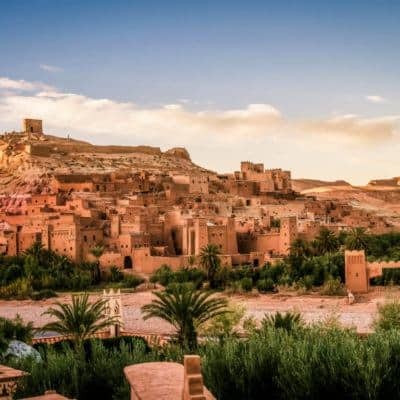 When I, Ruby, first saw the Kasbah Museum, it was not as a curious tourist, but as a choreographer holding rehearsals in the open building behind the museum’s gardens. It wasn’t until I had lived there almost a year that a took a more traditional walk around this beautiful building- I had been missing out. While, at first, I knew at least that the gardens are lovely, I can now wholeheartedly recommend the entire place as a wonderful site to pay a visit. This museum was once known as “Dar el Makhzen,” which translates roughly to “The Sultan’s Palace,” and was the residence of Portuguese governors between 1471 and 1661. It is now host to a collection of archaeological and ethnographic artifacts, most of which come from the north of Morocco. It is located in the Kasbah and can be reached easily by walking from anywhere in the city center or by petit taxi. The entrance fee is 20 dirhams per person and is open from 10am-6pm every day except Tuesdays. Right in between the hike from the Grand Socco to the port, you will come across a smaller square, lined with a few cafes and several shops and galleries. The Petit Socco is a popular stop for a coffee at Cafe Tingis, an old beatnik-era institution, or the slightly more modern Cafe Central. 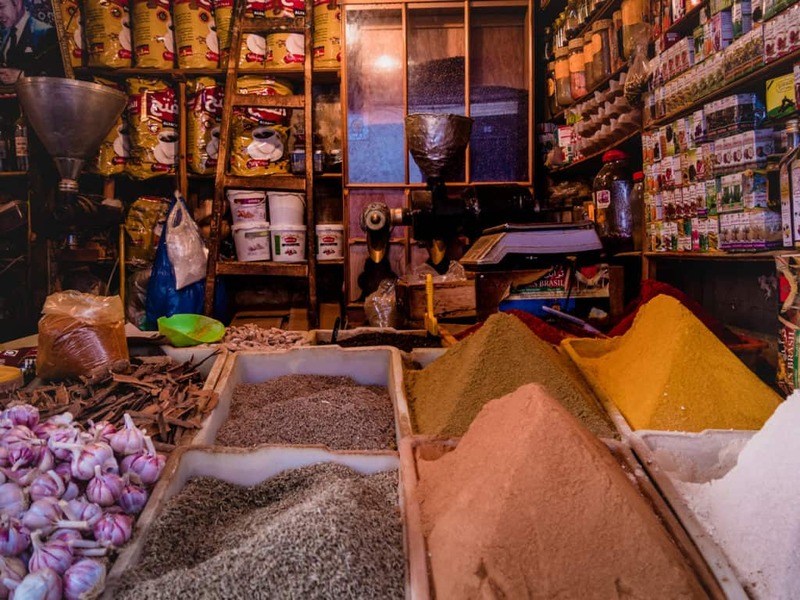 It snakes off into several small, winding streets of the old medina where you can find more hidden shops and markets to explore. 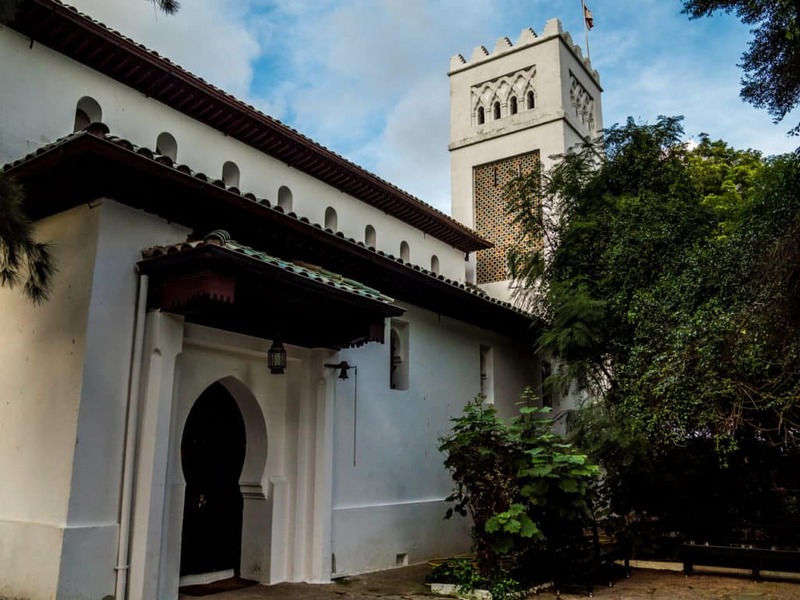 The American Legation is a museum, cultural center, and research library that holds historical and artistic artifacts and is home to a rich history of diplomatic relations between the United States and Morocco. It was, in fact, the very first American public property outside of the US and the renovated building has kept up its colonial-era historic feel. It is located in the old medina at 8 Rue d’Amerique and costs 20 dirhams to enter. Also, fun fact: Ruby’s husband (a Moroccan man she met here in Tangier) proposed to her in the gardens of the American Legation, creating yet another very small piece of multi-cultural history that happened in that location. You can read a tiny bit about their Moroccan wedding here. The Grand Socco goes by a few different names- Souk Ibarra, if you’re a local, but it is officially called Place du Grand 9 Avril 1947 after a famous speech given by King Mohammed V in support of Moroccan independence on, of course, April 9, 1947. Whatever you call it, this large open plaza in Tangier will most likely be a central marking point for anyone visiting. It is home to a large market on one side which is a wonderfully chaotic and sensory place to explore and a towering beautiful mosque just across the roundabout. 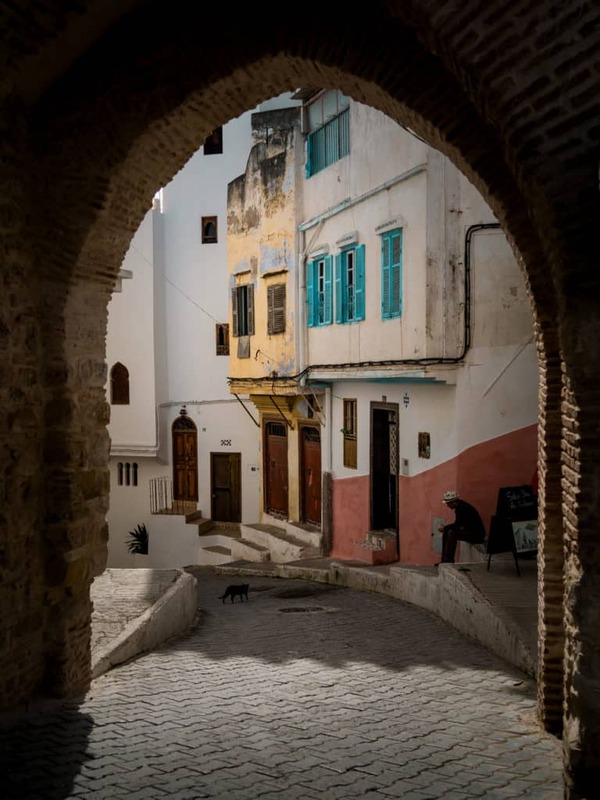 Bab Fass is the grand archway that leads into the old medina and up to the Kasbah and on the other side you can have tea and people watch from the cafe at Cinema Rif. 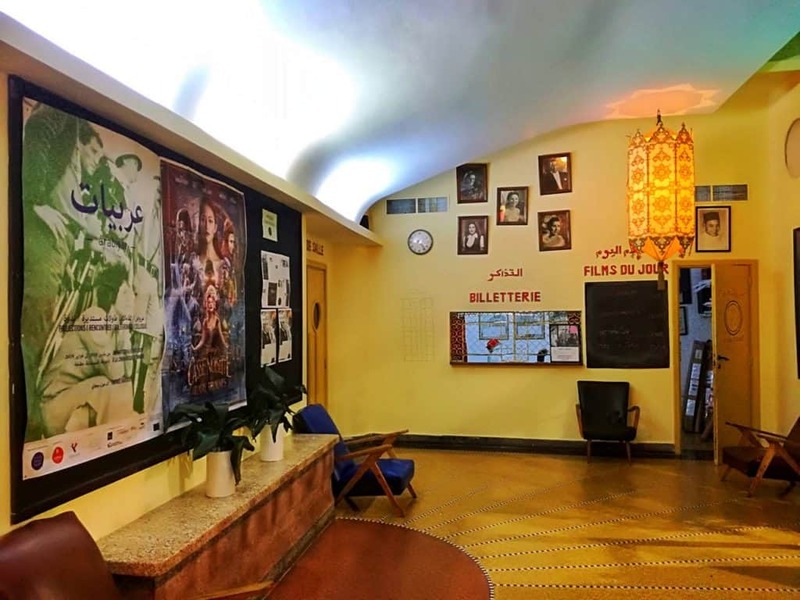 Cinema Rif is an old movie theatre where you can watch both alternative and mainstream films. It also has a cafe that is very popular among the young locals and artists of Tangier. It’s definitely worth going there to have a coffee or a glass of wine and enjoy the retro- ambiance of this artsy building. 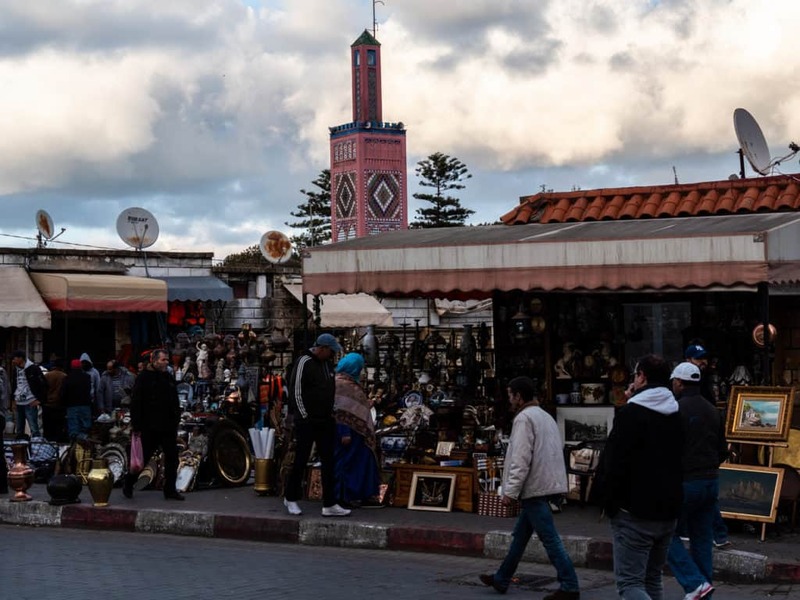 While the Grand Socco is always full of life and activity, if you venture out at night, you will find large crowds full of families taking an evening walk and loud street vendors selling everything from clothes to cotton candy to snail soup (a specialty in Tangier- I dare you to try it). This is an easy point to reach by taxi or on foot from anywhere in the city. 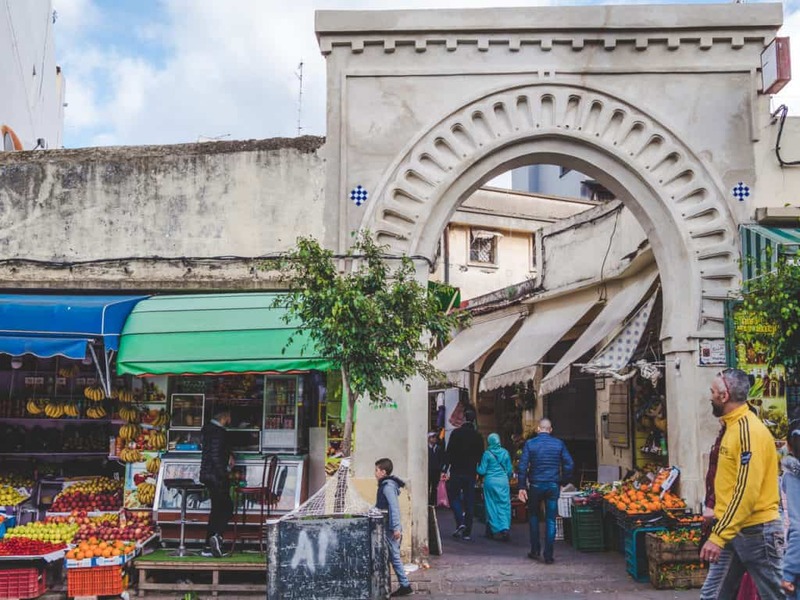 Like any other city in Morocco, Tangier also has a few colorful souks (markets) that are a pleasure for the eye and nose to visit. The biggest souk is the indoor Grand Socco Market, located at the Grand Socco (see above), where you can daily buy fresh fruits, vegetables, meat, bread, olives, herbs, etc. Every Sunday and Thursday, an outdoor farmer market is held on the streets near St. Andrew’s Church (see section below). 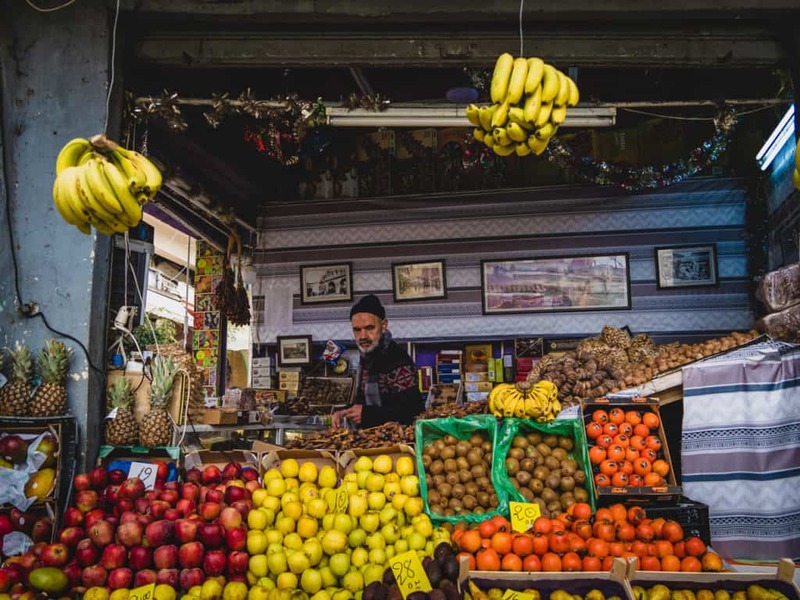 The Berbers from nearby villages come to Tangier to sell their products, mainly fresh fruits, and vegetables from their farms. 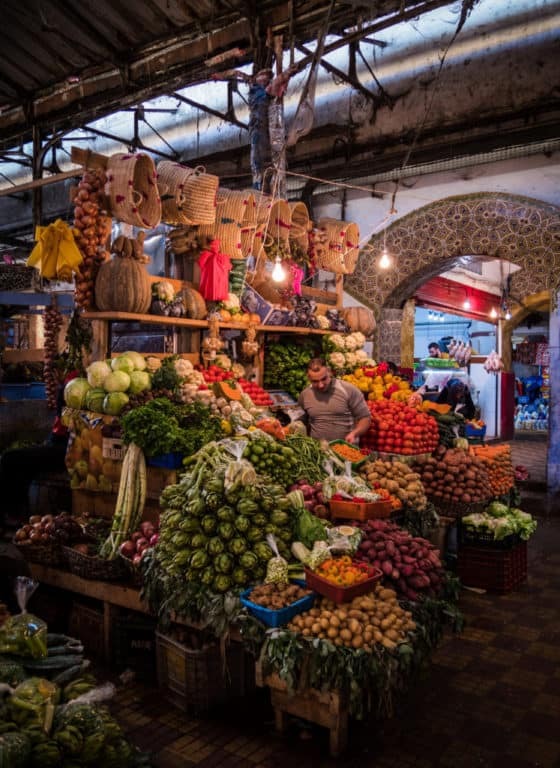 It’s a colorful and chaotic experience to walk through these streets filled with all the fruits and veggies you can get in Morocco! On the square opposite St. Andrew’s Church you can also buy Tajines, antiques, clothes and random old trinkets. 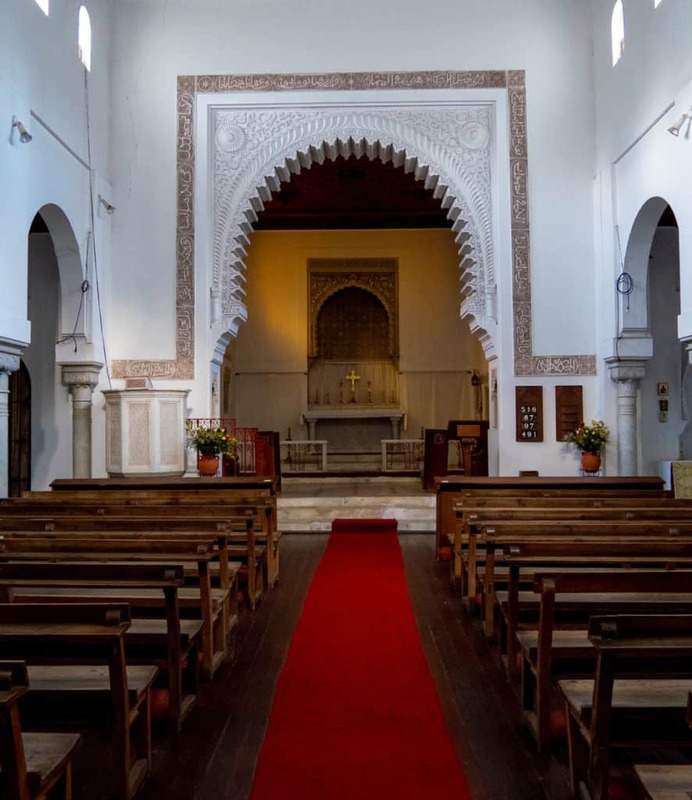 Visiting an Anglican church in Tangier, Morocco may sound a bit out-of-the-ordinary, but St. Andrew’s is a beautiful, historic sort of sanctuary in the middle of the bustling city. 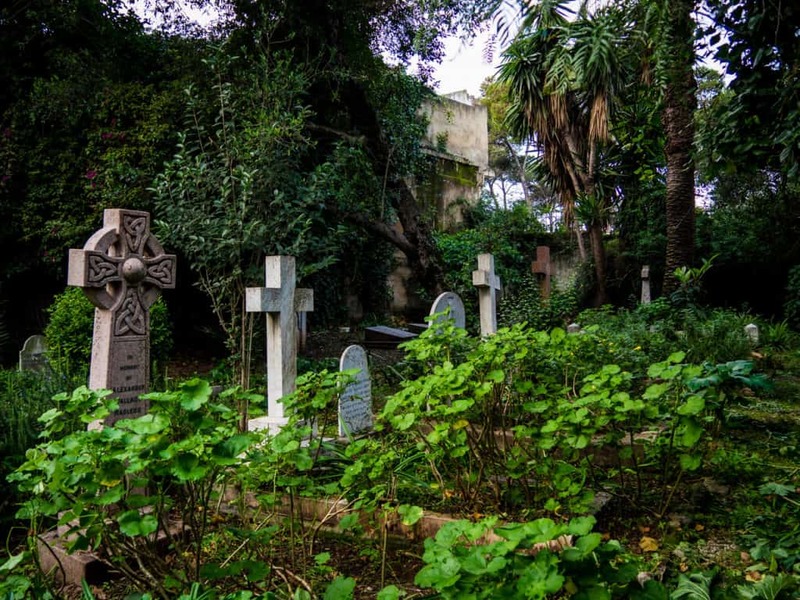 It was consecrated in 1905 and the overgrown, flourishing gardens in the churchyard are home to the grave sites of many historical figures. The chapel was also once painted by the famous French artist Henri Matisse during his stay in the city in 1912. You can visit St. Andrew’s for free and often the guard will give you a tour of the grounds and chapel. Being very close to the Grand Socco, it is an easy walk from the old medina and is located, appropriately enough, on Rue d’Angleterre (the English Road). 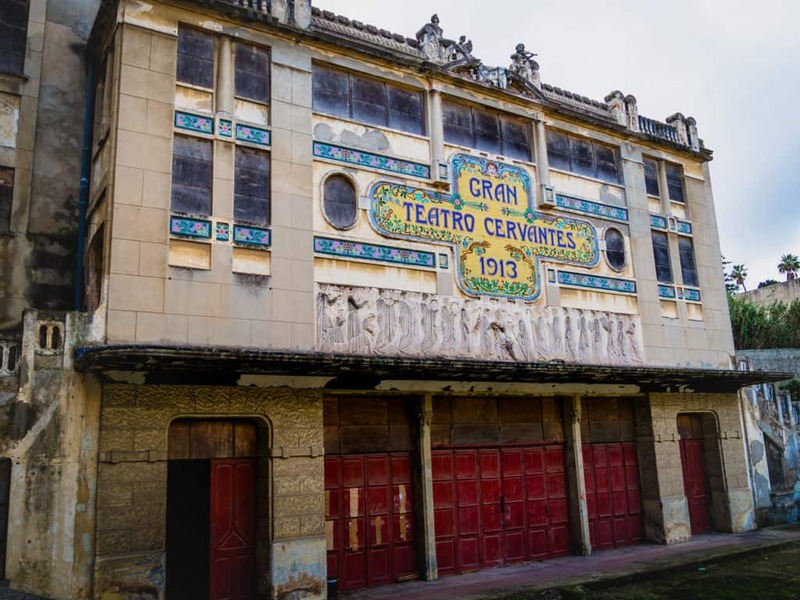 My dream is that someday this theater is fully renovated, keeping its beautiful old art deco style and that I can create a dance performance for its stage. In the meantime, however, I’ll have to make due with wistfully visiting the crumbling facade. 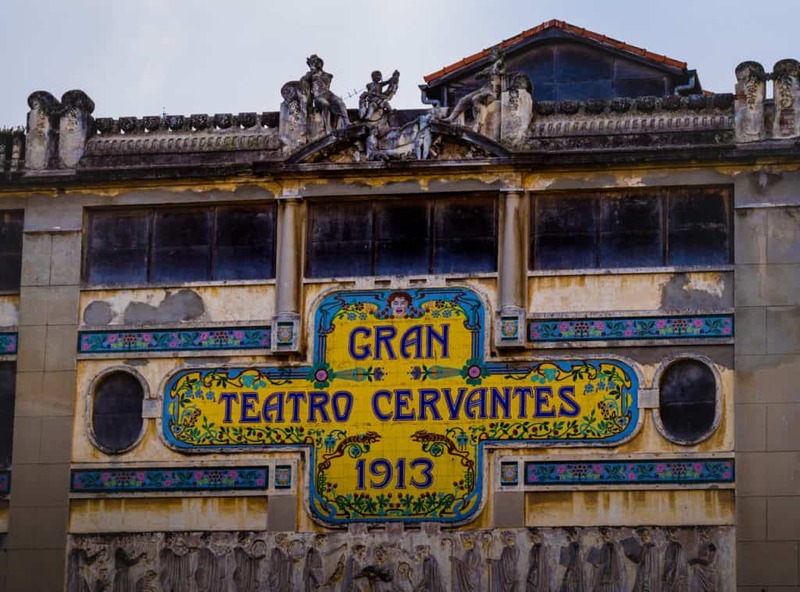 The Gran Teatro Cervantes was built in 1913 by the Spanish and was considered at one point one of the most prestigious theaters in North Africa. Now, however, restoration is on constant hold due to ongoing disputes between city officials and the Spanish government. For this reason, the interior is closed to the public, but the exterior is worth visiting for a look and a photo. You can always try and ask permission to enter the theater at the Spanish Consulate in Tangier. However, it might take at least one week and some money before you’ll know if you’re allowed to enter the Gran Teatro Cervantes. The theater is located on Rue Anoual, easily reached on foot from anywhere in the city center or by petit taxi. 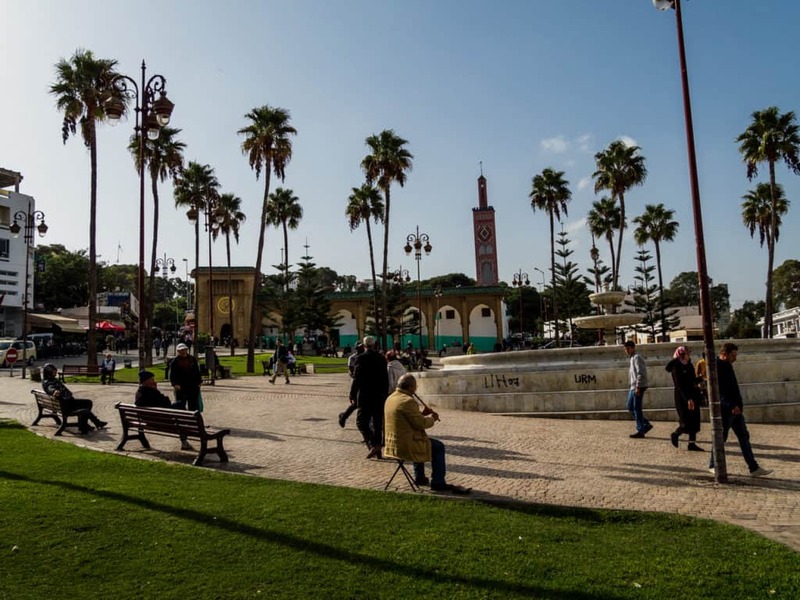 Sour Al Maâgazine, also known as “Faro Square“, has been for a long time the meeting place of friends and especially lovers in Tangier. Some very beautiful romantic songs have been dedicated to this popular avenue of Tangier. In the summer, this avenue is always full of people enjoying a breathtaking view of the port and the bay of Tangier. People also come to enjoy the constant light breeze coming from the Mediterranean sea. 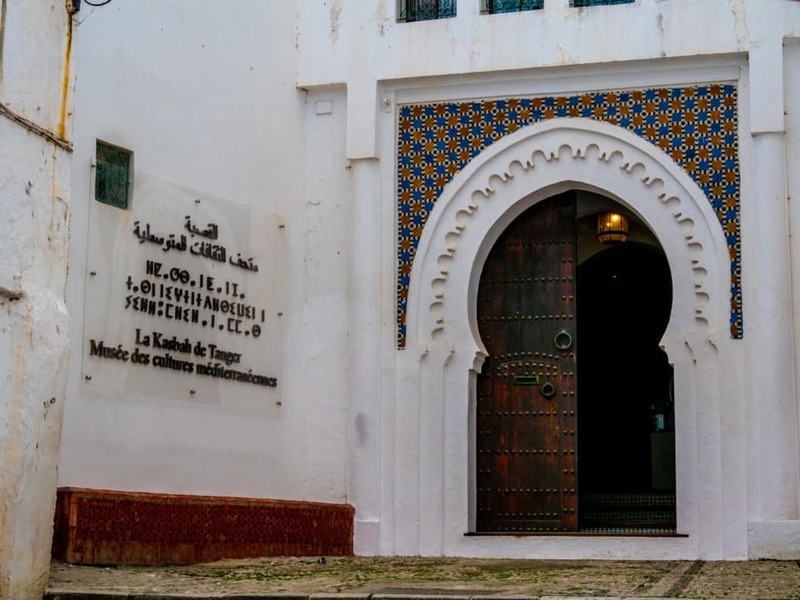 It is located on Pasteur Avenue and it’s only a 7 minutes walk to get to the Grand Socco and the entrance of the Old Kasbah. 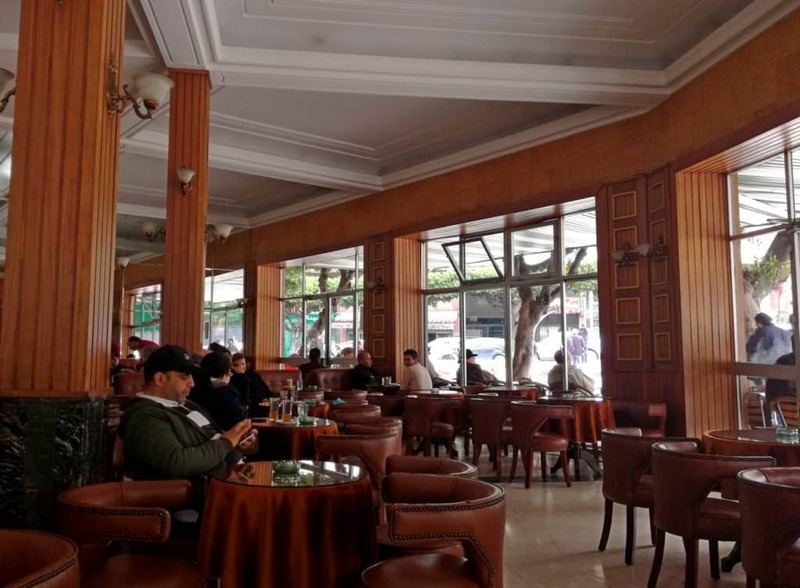 Gran Cafe de Paris is one of the oldest cafes in Tangier and is part of Tangier’s bohemian history. The cafe opened in 1927 and was a place of inspiration for many known artists and writers like Jack Kerouac, William Burrough, Paul Bowles and Tennessee Williams – just to name a few – to gather here, have a coffee, smoke a cigarette and discuss life and literature. Part of the movie The Bourne Ultimatum was filmed in and around Tangier and this cafe has also a moment of fame in the movie. The interior of the cafe has a peculiar atmosphere. Strange how inspiring the old leather of the chairs, the dark paneled walls, the stale smell of cheap tobacco and the rustling sound of newspapers can be. The waiters are dressed in red jackets and it gives you a feeling of an old private ‘Gentlemen’s Club’ (but women are allowed here as well). 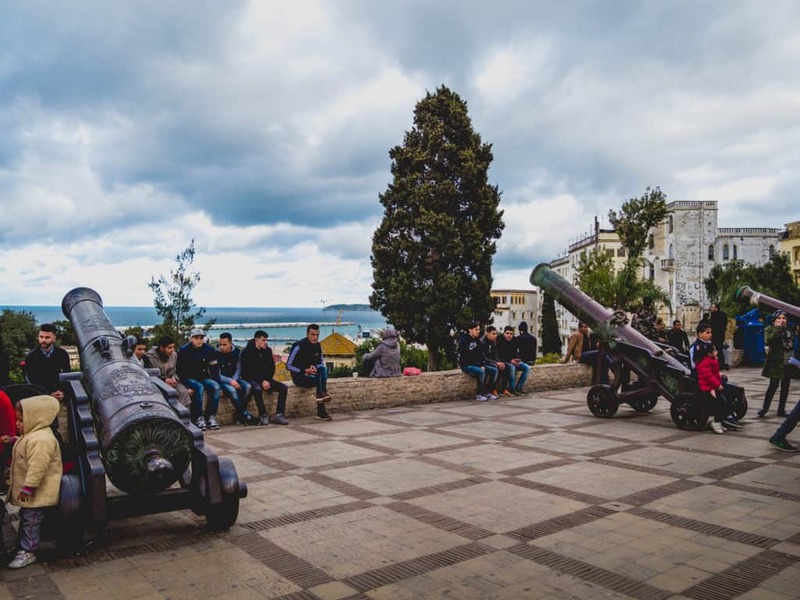 If you prefer a more organized trip to explore Tangier, here are a few fun and interesting city tours you can join. Tangier has now official Hop On Hop Off Buses that will bring you to all the different places of interest in one day! These red double-decker buses run daily from 9 am to 6 pm from April to October and from 9 am to 5 pm from November to March between the historical center of the city to the modern part. You can hop on and off the bus at the 11 stops as often as you want. Here’s a detailed itinerary of the Tanger Ville Route. You can board the bus at any of the 11 stops. Tickets can be purchased when you board the bus and cost 130 MAD per person. These tickets are valid for 48 hours and can also be used for the Espartel Tour Route Bus (see Day trips from Tangier below). 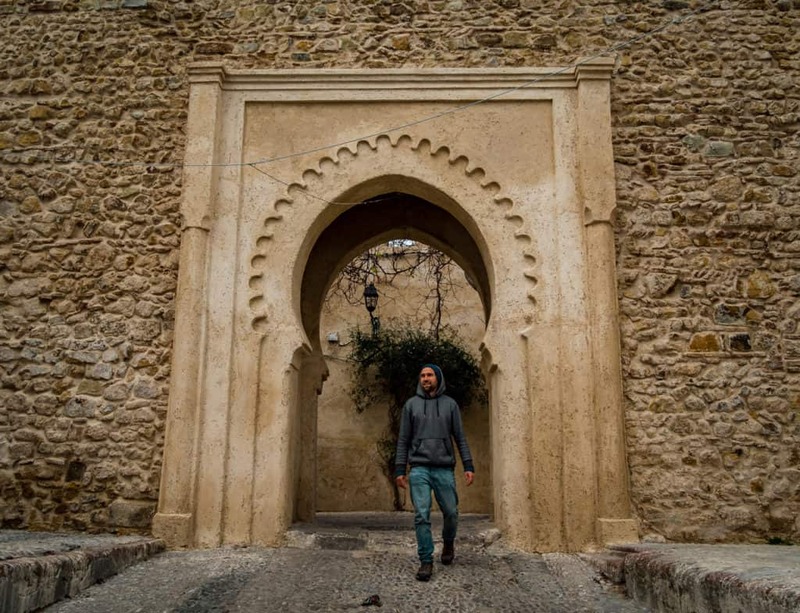 There are also opportunities to explore Tangier with a local guide. You can find an overview of these tours on Get Your Guide. 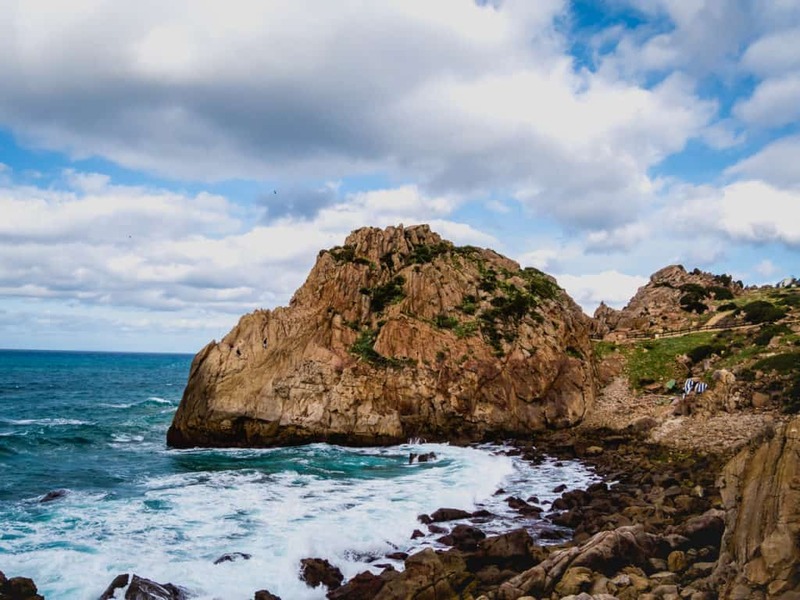 If you have time, you should definitely go on a day trip to Cap Spartel and the Caves of Hercules! Both places can be visited together in one day and I would recommend making the 5km walk from one site to the other along the beautiful beach called ‘Robinson Plage’. Cap Spartel is a cape located 14 km from Tangier. The cape rises to a height of 326 m and there’s a beautiful lighthouse at the end of the cape. What makes this place so special? On a sunny day, you have an amazing view of where the Atlantic Ocean and The Mediterranean Sea meet. The Caves of Hercules (Les Grottes d’Hercule) are a bit of a symbol for Tangier, with their strange sea entrance, shaped like a map of Africa. 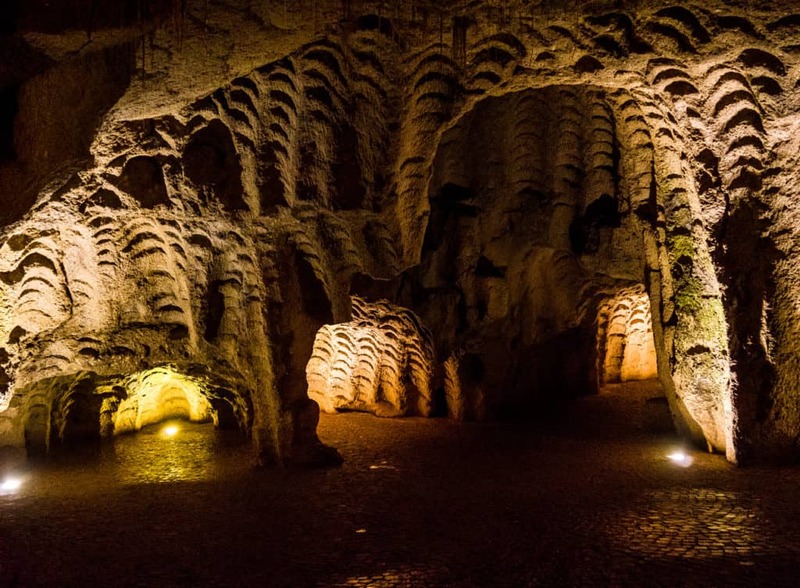 The main caves are part of a massive archaeological cave complex located 14 kilometers west of Tangier. The caves are part natural and part man-made. The natural part was formed by the waves of the Atlantic Ocean while the man-made part was used by Berber people to cut stone wheels from the walls. 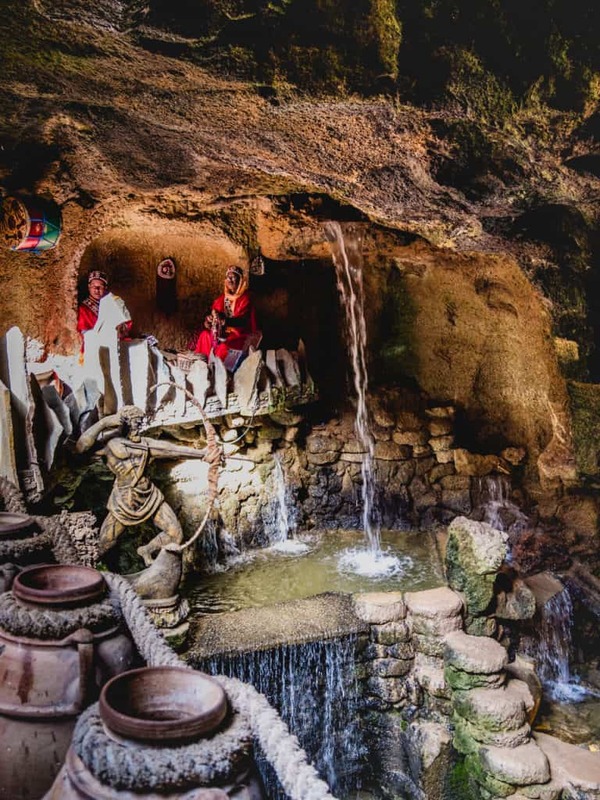 The caves date back to 2500 BC and the name comes from the legend of Hercules as it’s believed he slept in these caves before attempting one of his 12 labors. 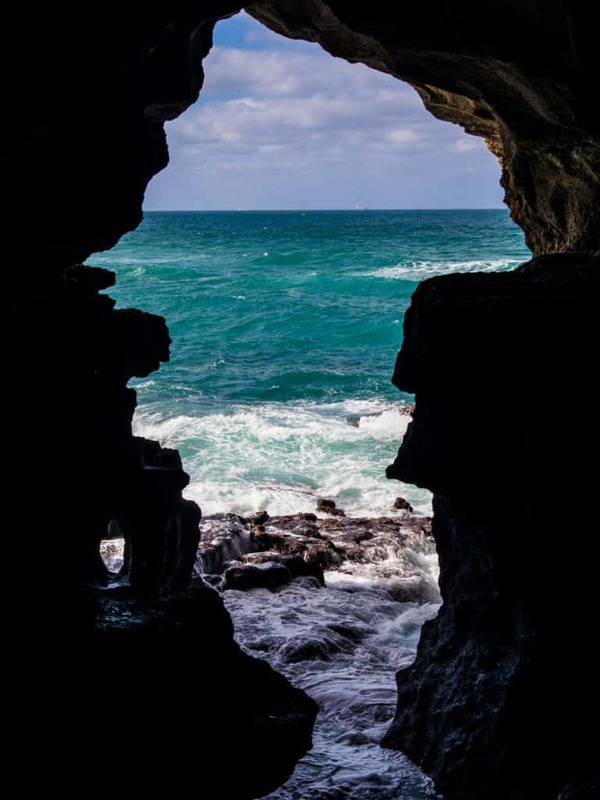 A visit to the natural caves to admire the sea entrance shaped like the map of Africa is free. To visit the man-made caves, you have to pay 5 MAD. Although this is very cheap, I don’t think it’s really worth it. There isn’t really anything special in the man-made caves, unless you want to take a picture with a monkey or parrot on your shoulder (see Common Scams in Morocco). It’s very easy to get to the Caves of Hercules and Cap Spartel. Any Petit Taxi (the small blue taxis) in Tangier will take you there. You might have to bargain for the price as the driver will very likely charge you 100 MAD but know that a one-way ride to the Caves or the Cap is 50 MAD. You can also take the blue Hop On Hop Off Bus that follows the Espartel Route. This bus departs from Socco Alto and you can hop on and off the bus at any stop along the route (which include Cap Spartel and the Caves of Hercules). 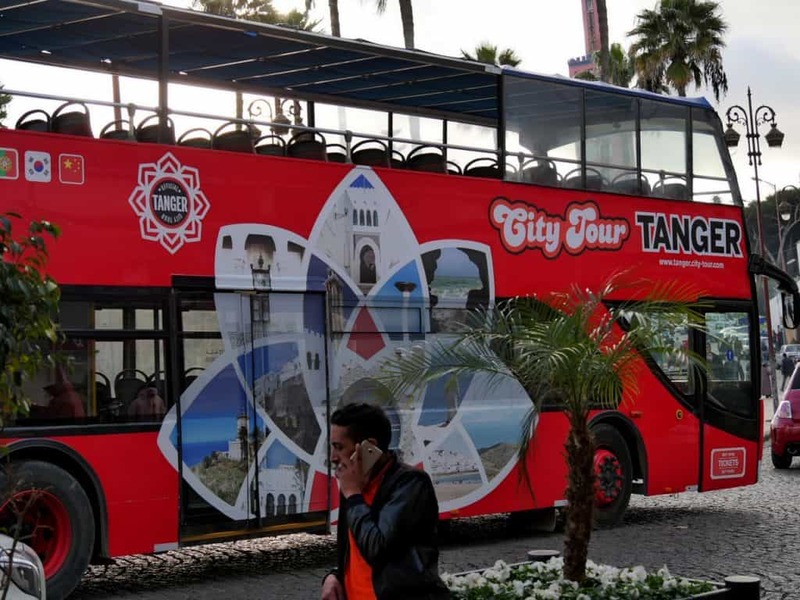 One ticket costs 140 MAD and you can also use the ticket for the Tangier Ville Route Bus (see City Tours in Tangier). I recommend you visit the Caves of Hercules first, then walk north along the beach towards Cap Spartel. It’s only one hour of walking and it’s very enjoyable, especially on a sunny day. Along the way, you’ll come across abandoned holiday houses, caves and cliffs. The ruins of Cotta, an ancient Roman settlement founded in the 2nd century, are very close to the caves of Hercules and Cape Spartel. The remains of a factory building, a temple, and some baths complex have been unearthed here, and it is believed that the inhabitants of the settlement made a living by producing a type of fish sauce as was the case with the town of Lixus (see 4. Ruins of Lixus), one of Morocco’s oldest continuously inhabited sites. Unfortunately, you can’t visit these ruins anymore as a rich Arabian sheik (or so the story goes) has bought land around the ruins, thus fencing them and preventing tourists from accessing the area. The Al Kamra Tower or the Borj Al Kamra is one of the oldest historical sites in Asilah. It was built in 1509 when the city was under Portuguese occupation so it’s a perfect example of Portuguese architecture in Morocco. This tower was built under the orders of the King of Portugal Emmanuel I to serve as a residence for his married daughter to the Portuguese governor of Asilah. He wanted to make a beautiful and huge building to allow his daughter, very attached to his country, to see Portugal from the coast of Morocco. Construction began in 1505 and it took four years to achieve an architectural marvel that centuries later is among the oldest historical monuments in the city. 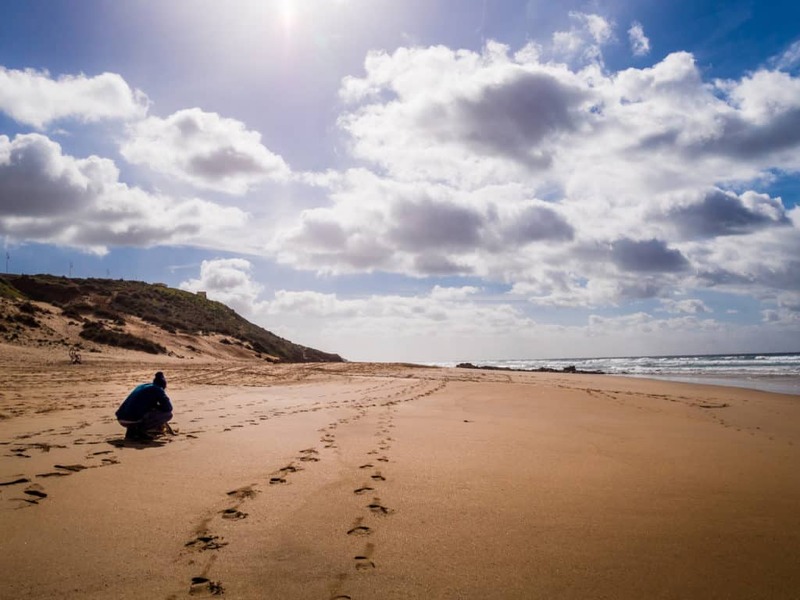 Getting to Asilah from Tangier is very easy as the cities are only 50 km from each other. It’s possible to get there by taxi or by train. Moroccan Railways (ONCF) have a train from Tangier to Asilah every 4 hours. Tickets cost between 19 and 50 Moroccan Dirhams and the journey takes 42 min. It’s also possible to get there with a shared Grand Taxi (the big beige ones) for 45 to 75 Moroccan Dirhams. 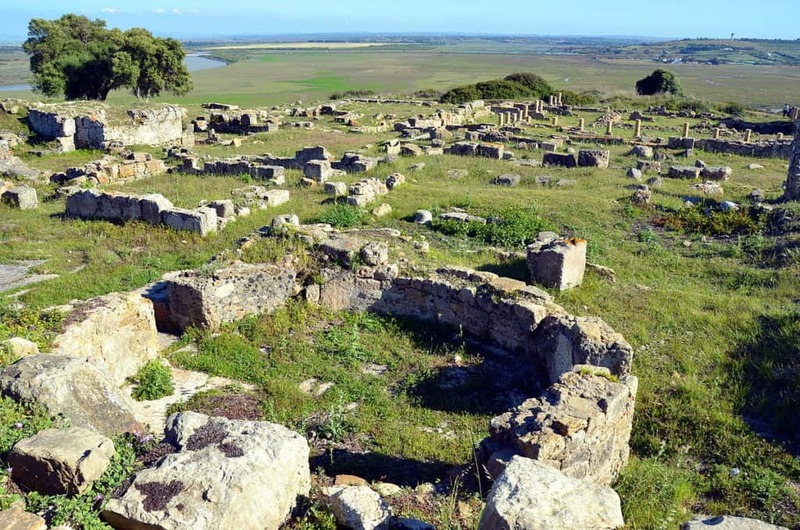 Lixus is the site of an ancient Roman-Berber city located in Larache. Megalithic stones found in the vicinity of Lixus suggest that the site was originally inhabited by a sun-worshipping people with knowledge of astronomy and mathematics and then became a Roman city. The main gate to the ruined city is just off the highway. Only about a quarter of the ancient city has been unearthed from the ground so far. The ruins that are visible, although badly damaged and a bit overgrown, hint at how big and important this city once was, and it’s totally worth a visit. There is no entrance fee at the moment but if there is a guardian on duty, he will usually be happy to lead visitors through the site for a small tip. 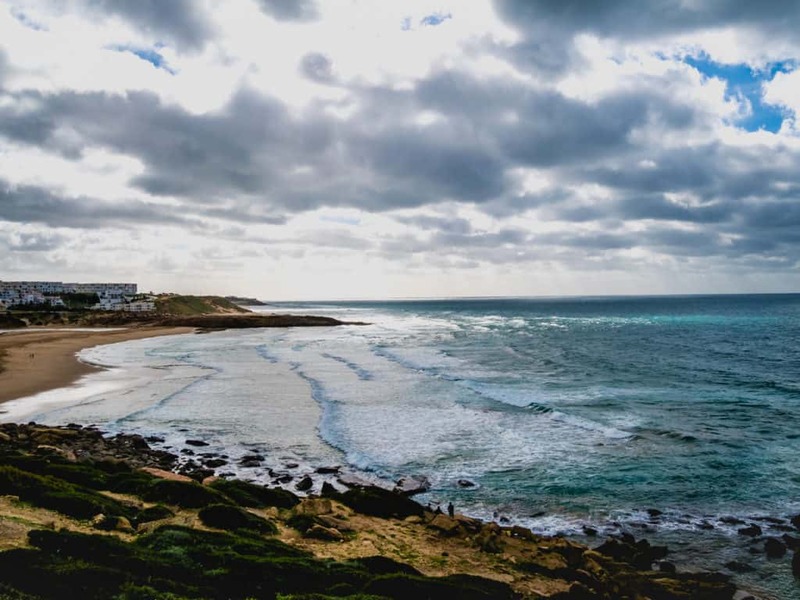 Larache is located 88 kilometers south of Tangier following highway A1. You can reach this city from Tangier by train, by taxi or by bus. Tangier is a city that is worth taking the time to discover, so you will want to stay there at least a night or two. It is a city rich in traditional architecture. One of the best experiences you can have in Morocco is staying in a Riad, typical rich Moroccan houses with indoor courtyards and fountains, designed with zellij (Moroccan tiles). 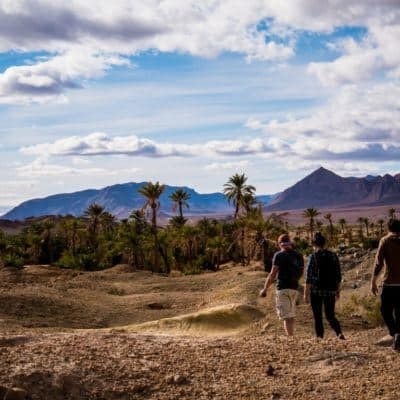 Tangier also offers a wide choice of hostels for budget travelers who want to save money to explore during the day and swap stories with fellow backpackers in the shared kitchen or bar in the evening. This property is located only 3 minutes walking from the beach and is the perfect place to stay in summer. They offer barbecue facilities on the terrace, as well as a shared lounge where it’s possible to relax and exchange stories with backpackers. 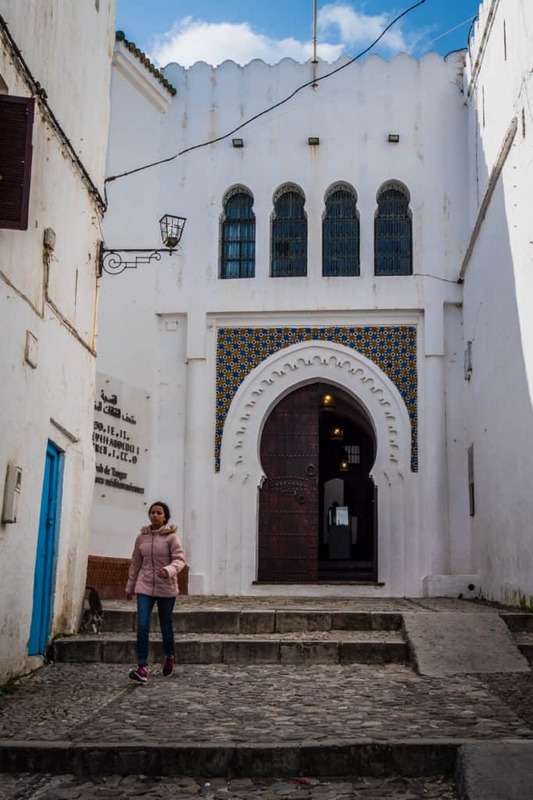 The Melting Pot Hostel Tangier is located in the Old Medina of Tangier, not far from the American Legation Museum. The kitchen comes fully equipped with an oven, a coffee machine, and a microwave so it’s the ideal place if you want to cook your own meals. There is also a toaster, a fridge, and a kettle. A healthy buffet breakfast can be enjoyed at the property. Dar el Makhzen is only 2.2 km away from the hostel, while the Kasbah Museum is 2.3 km from the property. Tangier Ibn Battouta Airport is 15 km away. Staying in the Old Medina is a great choice for travelers interested in markets, old town exploring and culture. This property is 12 minutes walk from the beach. It features barbecue facilities and free reliable WiFi, Tangier Kasbah Hostel is located in the old city, a few steps from Dar el Makhzen and only a hundred meters from the Kasbah Museum. They have a garden, a terrace, and a shared lounge. All the rooms in the hostel come equipped with a coffee machine and a seating area. You can also enjoy a continental breakfast served every morning at the property. Tangier Ibn Battouta Airport is only14 km from this hostel. This hostel has a beautiful terrace and is located less than 1 km from the American Legation Museum. It is only 1.8 km from Dar el Makhzen and the Kasbah Museum. Free WiFi is provided. The rooms are very cozy and include a shared bathroom. A continental breakfast can be enjoyed every morning at the property. The staff speaks Arabic, English, Spanish and French and will be happy to provide the guests with practical advice on the city at the reception. Ibn Battouta Airport is located 15 km from The Medina Hostel. Another great hostel we recommend in the heart of the old city is Tangiers Hostel. If you want the comfort of your own private luxurious room and private bathroom right in the heart of the old Kasbah, I would absolutely recommend a stay at the Dar Nour. The owners are dear friends of mine and made me feel so welcome in Tangier during my whole stay in their guesthouse. 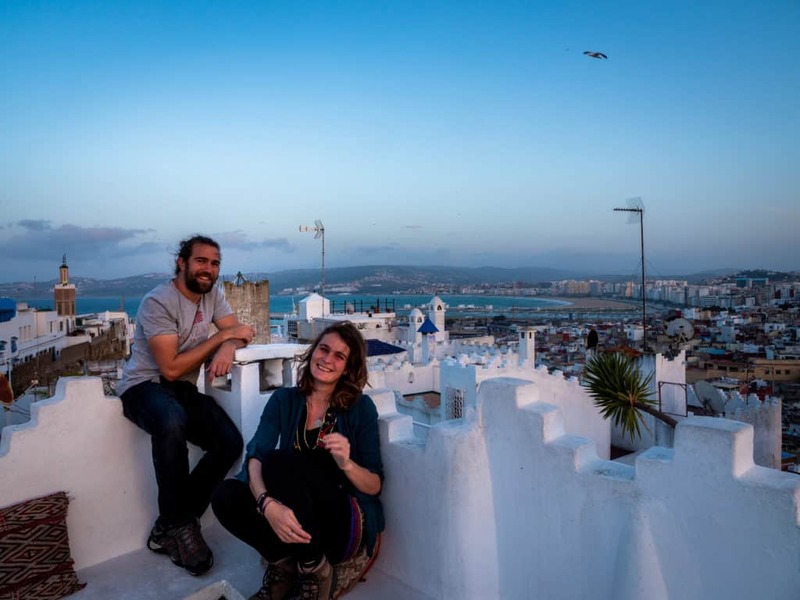 Having lived themselves as expats in Tangier for years, they know the city very well and can advise you on all the best restaurants in the city and everything you should do while you are there. They also own the restaurant “Le Salon Bleu” which is located only 5 minutes away. Each room at the Dar Nour has a completely unique style and atmosphere and includes a private bathroom and shower. The Dar Nour has a terrace with a view of the beach and a massage room can be used to relax after a long day walking around the old city. The property also has free wifi in every room and in all the common areas. A traditional breakfast composed of fruits, pancakes, cakes, and cheese is offered every morning. Local specialties are proposed in the property’s dining room and a bar is at your disposal at night. 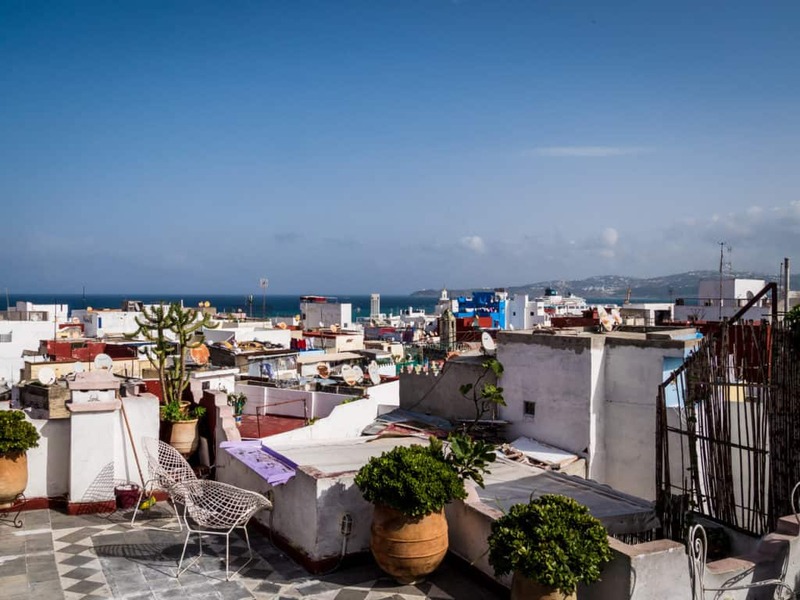 If you want an awesome stay while in Tangier, Dar Nour is an absolute must! 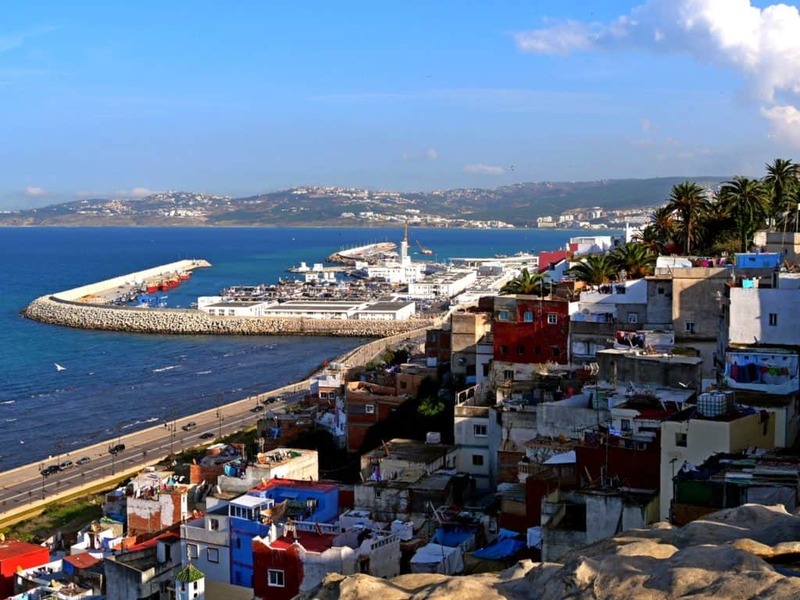 Tangier is a city that is rich for its architecture and fascinating history. One very special type of Moroccan building that combines both architecture and history is the Riads. They are typical Moroccan buildings that started appearing during the Idrisid dynasty. they usually have indoor courtyards with gardens and fountains. One notable feature of their construction is that they are designed with zellij (Moroccan tiles). No stay in Morocco would be complete without at least one night in a Riad. Here are some of the best riads in Tangier. 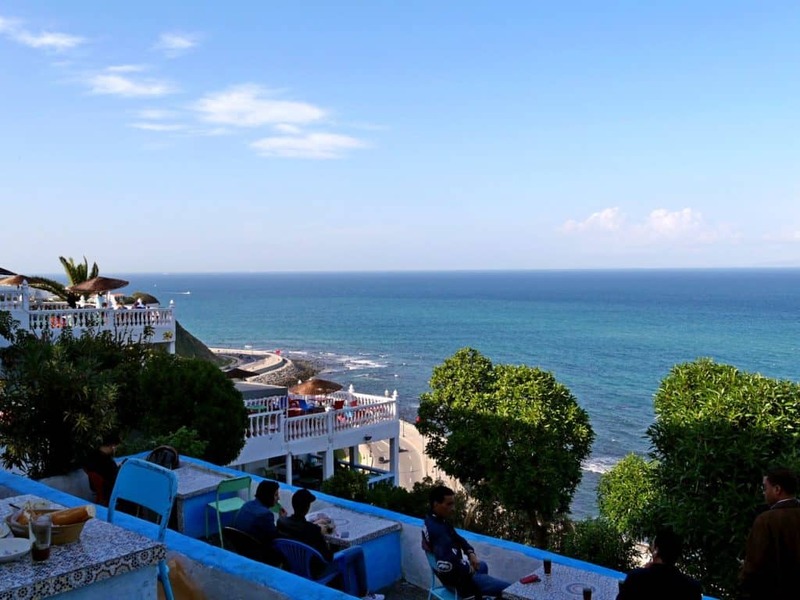 This Riad offers a sun terrace and beautiful views of the sea, Riad Mokhtar is located in Tangier, 5 km from the Madina Tanger Supermarket (Marjane). Each room at this riad comes equipped with a flat-screen TV. Some rooms include a seating area where you can relax. Some rooms offer a view of the mountains or the garden. Every room comes equipped with a private bathroom. Extras include bathrobes, slippers and toiletries. Riad Mokhtar also features free WiFi throughout the property. Cap Malabata is 7 km from Riad Mokhtar. The nearest airport is Tangier Ibn Battouta Airport, 11 km from the Riad. Two other Ryads definitely worth checking in Tangier are Riad Tingis and Dar Nakhla Naciria. This is hands down the best restaurant to get as close to home-cooked Moroccan food that you can possibly find in the city. It’s a local, bustling place with plastic wrapped tables and giant baskets of bread plopped down in front of you as soon as you are seated. The food is always fresh and delicious (beware that because of this, sometimes they don’t have everything on the menu), and the waiters, while constantly running around to keep up with the demand, are kind and helpful. It is also ridiculously cheap, with a bowl of bissara going for only 7 dirhams and a chicken tagine for about 20 or 30. It is where I immediately take all of my friends and family who visit me here. Make sure you say hi to Bachir himself, the owner, who is always hanging around at the cash register. 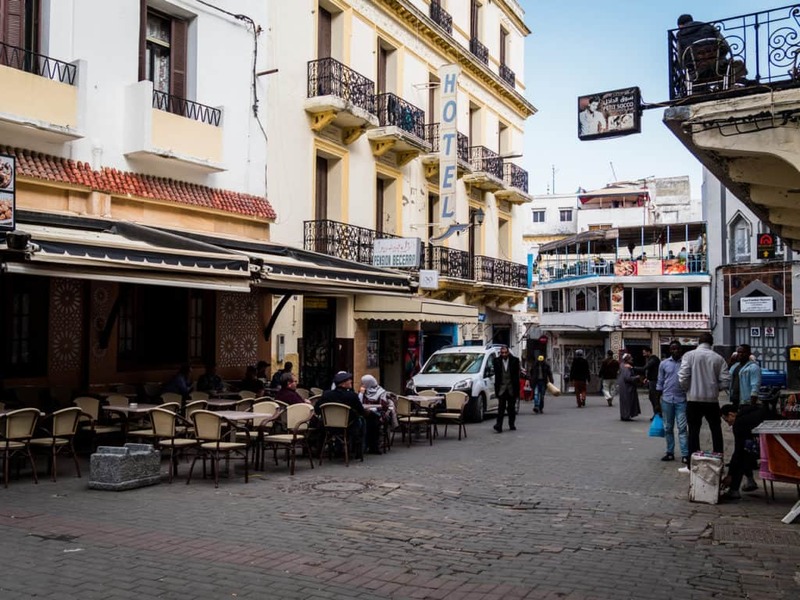 This place is located on Rue Zyriabe, a busy street close to boulevard Mohammed V, lined with many local spots to grab a bite. Located off of the beaten tourist track in a more residential part of the city, this restaurant serves delicious local specialties in an Arabic-lounge-like environment. 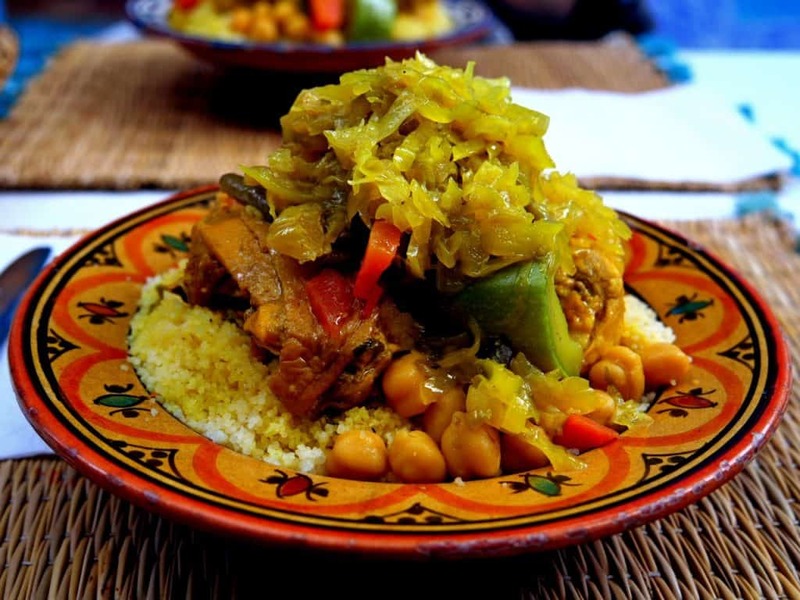 Get ready to chill out on old cushions in low lighting and enjoy a slow-cooked meat tagine, couscous on Fridays, or ask for my absolute favorite, r’fissa- a chicken and bread dish that is pure comfort food. A meal here is also on the cheaper end, costing between 30-60 dirhams per person. You can walk or take a petit taxi to Dar Naji, located at 11 Rue Ajroum. If you want to sit, have a good, hearty and flavorful meal, and people watch for an afternoon, this is the place to do it. Located just on the edge of the Petit Socco, this small but charming bistro offers Moroccan food with a bit of French flair. I have never been disappointed by a dish here and the owners are always friendly and accommodating. I would say it is in the medium price range in terms of places in Tangier, a main dish going for about 60-80 dirhams. 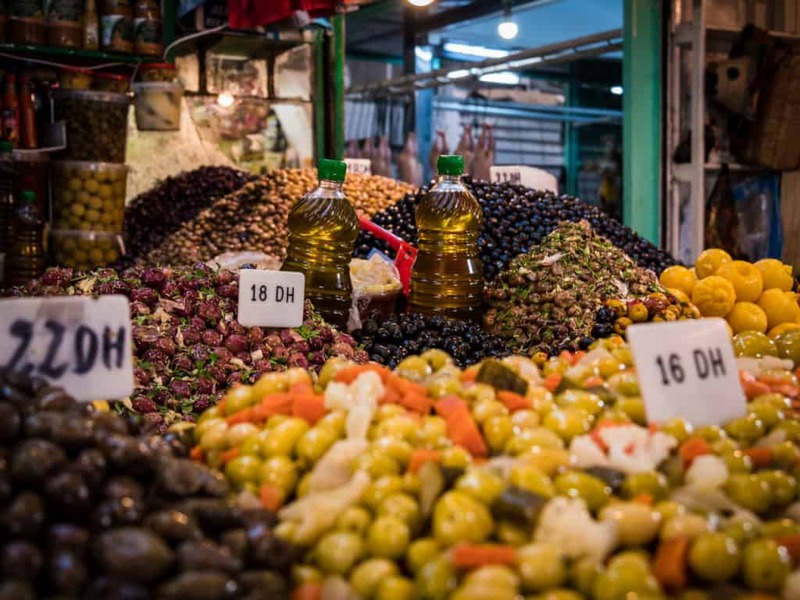 Read also: How much does it cost to live and travel in Morocco? Since Ruby lived in Tangier for such a long time, she also found out where to buy alcohol in Tangier. If you’re on the hunt for a bottle of wine or are in need of some drinks to take to a friends house, it may seem near to impossible to find alcohol anywhere in the city. Do not despair. 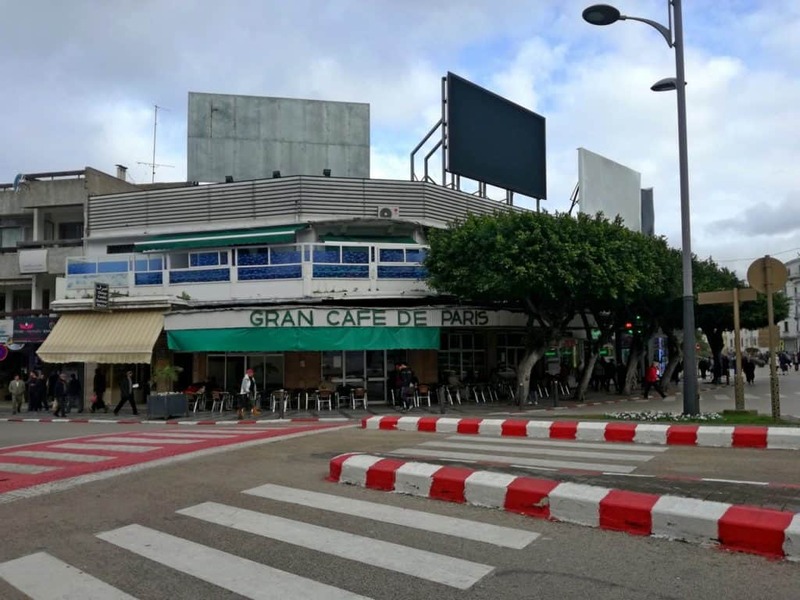 While, of course, being a Muslim country and due to legal restrictions it may not be as easily accessible as in some cities, there are several shops that do sell alcohol in Tangier. 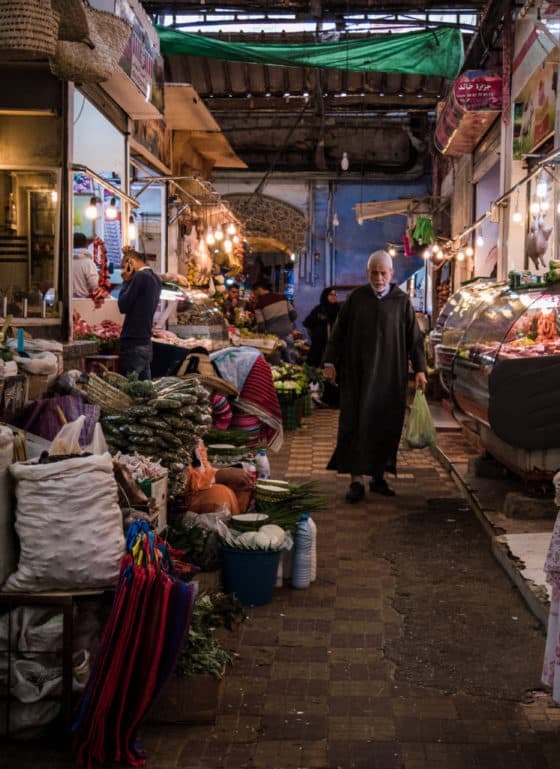 This little market is just off of the main boulevard Mohammed V and not only sells wine, beer, and spirits, but also a collection of imported items from Europe including pork products, if you’re missing bacon or ham. Another store selling alcohol, imports and specialty items (it’s where I always buy natural peanut butter- my one guilty pleasure from home). 3. The Market on Rue de Fes. This place doesn’t have a name that I know of, but it is a hole-in-the-wall market selling drinks of all kinds, both alcoholic and sodas. It is at the top of the street in between Avenue Belgique and Rue Mexique, just to the right of a well-known local pastry shop called Alaska. Tangier has an international airport where many flights, especially from Europe, arrive on a daily basis. You can only get from the airport to the city center of Tangier by taxi. These taxis will be at the exit of the terminal and have fixed prices. A ride from the airport to the city center costs 100 MAD . To get from Tangier to the airport, you can take a Petit Taxi (the blue ones) from anywhere in the city. Some taxi drivers will try to charge you more but know that the fixed price to the airport is 100 MAD as well. Arriving in Tangier by ferry is a great way to start your journey in Morocco. I particularly enjoyed seeing the land getting closer and closer from the boat and felt so excited when Tangier was in sight. There are currently two Ferry companies operating in the Strait of Gibraltar bringing people from Tarifa to Tangier and vice versa. The FRS service runs up to 8 times per day with a sailing duration of around 1 hour while the Inter Shipping service runs up to 6 times per day with a duration of 2 hours. Taking a ferry across the straight to Spain is also a great way to renew your Moroccan travel visa. 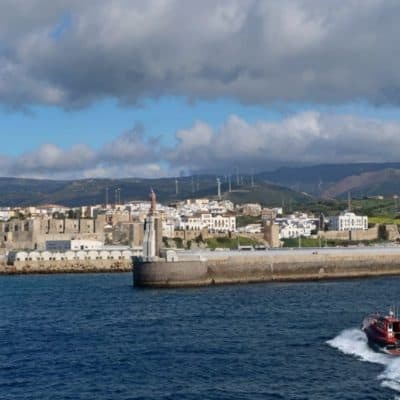 Tangier ferries also connect Morocco with Spain, Italy & France with crossings available to Tarifa, Algeciras, Malaga & Barcelona (in Spain), Genoa & Savona (in Italy) & Sete (in France). Tangier Ferry crossings are operated by FRS, Inter Shipping, Balearia, Trasmediterranea, Grandi Navi Veloci, Grimaldi Lines & AML and, depending on the time of year, you’ll find a choice of up to 69 ferries crossings daily. 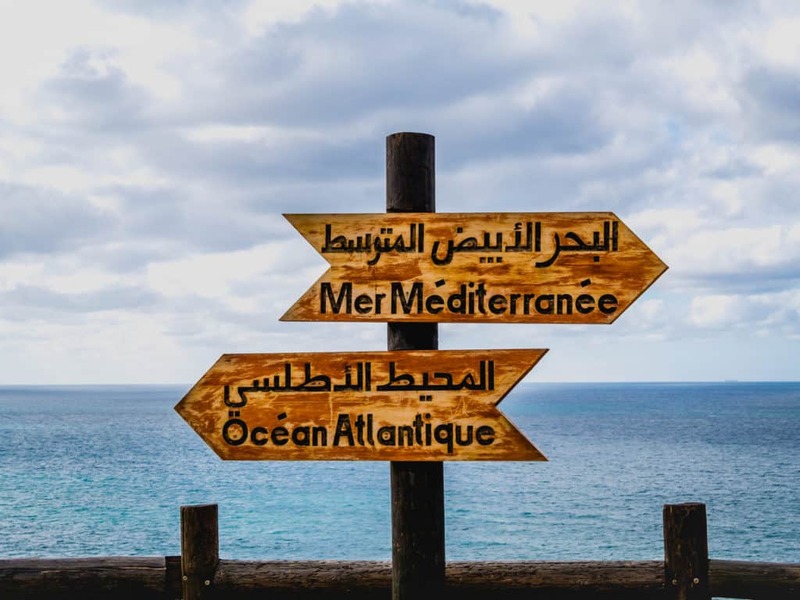 Since most people will arrive and start their visit to this superb country in Casablanca, I decided to include practical information on how to transit between the two cities. The best way to get from Casablanca to Tangier is by bus with the number one bus company in Morocco called CTM. I’ve traveled around Morocco with different companies and I have to say that CTM although being slightly more expensive than other bus companies, also provides much more comfortable buses. The trip between the two cities will cost between 120 and 190 Moroccan dirhams and takes around 5 hours. There is a direct bus leaving from Casablanca and arriving in Tangier. Buses leave every four hours, and they operate every day. You can catch the bus at the CTM bus station in Casablanca on Rue Léon (see map below). You can reserve your ticket in advance at the bus station or book it online. However, if you book your ticket online, you still have to go to the CTM office to pay for your luggage on the day of departure so make sure you arrive at least 30 minutes in advance. In Tangier, you’ll arrive at the main city bus station “Gare Routiere” at Place al Jamia al Arabia (see map below). From there you’ll have to take a taxi (see Getting around in Tangier) to reach the city center. If you have your own car or if you are renting one, the road from Casablanca along the coast is definitely a pleasant drive. The driving distance between Casablanca and Tangier is 338.82 km. It should take around 3 hours to reach the northern city. Driving from Casablanca to Tangier is a great idea if you have the time and if you want the freedom to stop along the coast and take great pictures. 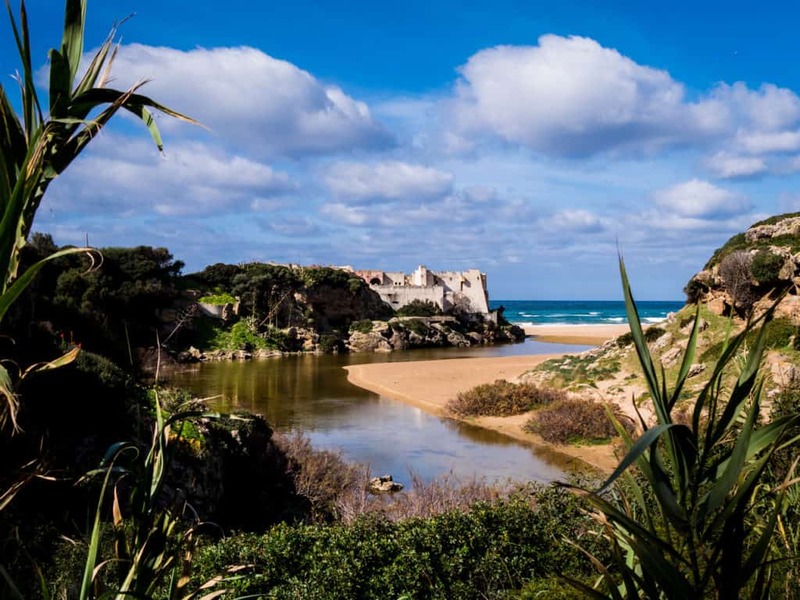 You will also drive through other beautiful cities such as Rabat (the capital of Morocco) and Larrache (where you can visit the Ruins of Lixus). To drive from Casablanca to Tangier simply follow highway A1 towards the north along the coast. 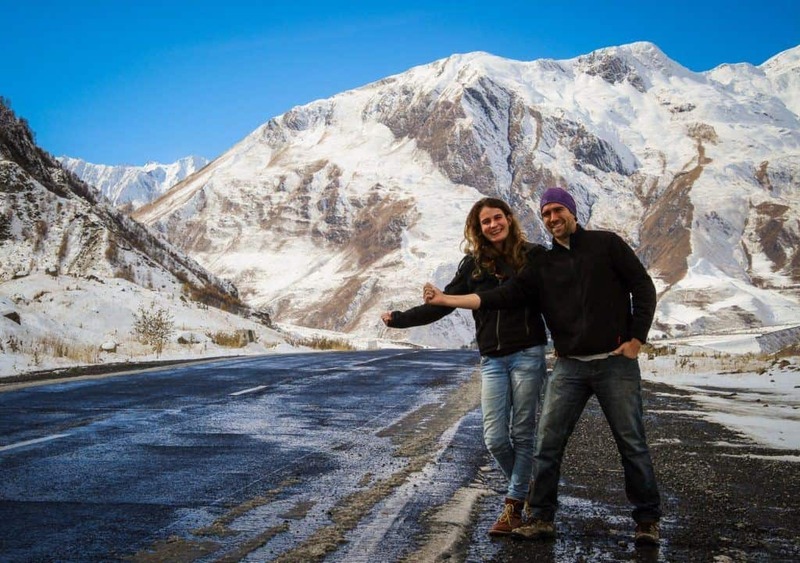 Driving on highways and on countryside roads in Morocco is usually quite safe, however, if you drive in big cities like Casablanca, Tangier, or Marrakech, it can be quite challenging. In large cities, it can often feel very chaotic. You will definitely feel a big difference between the cities, the smaller towns and rural areas when it comes to driving. Another thing worth noting is that in large Moroccan cities, red lights and stop signs are sometimes completely on the far right of the road, so they are super easy to be missed if you don’t pay attention. Sometimes they can also be a bit hidden behind tree branches. Another great option to get to Tangier from Casablanca is to take the train. 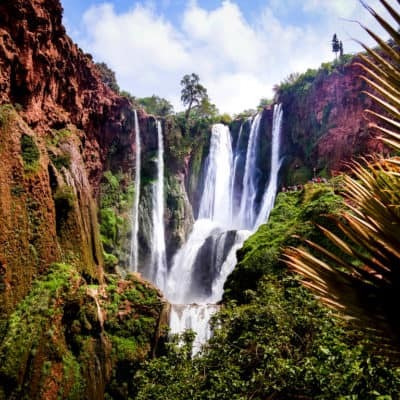 Traveling around Morocco by train is a great option because they’re cheap and they are a great way to see the incredible Moroccan landscapes. In Morocco, it’s very easy to buy your train tickets in person directly at the train station. All the information on prices and timetables can be found on the ONCF website, once you know which train you will take you can head over to the Casablanca train station to buy your ticket. Make sure to bring cash to buy your ticket as it’s not always possible to pay by debit or credit card. There is a direct train leaving daily from Casablanca (see map below) and arriving at Tangier. It leaves five times a day. 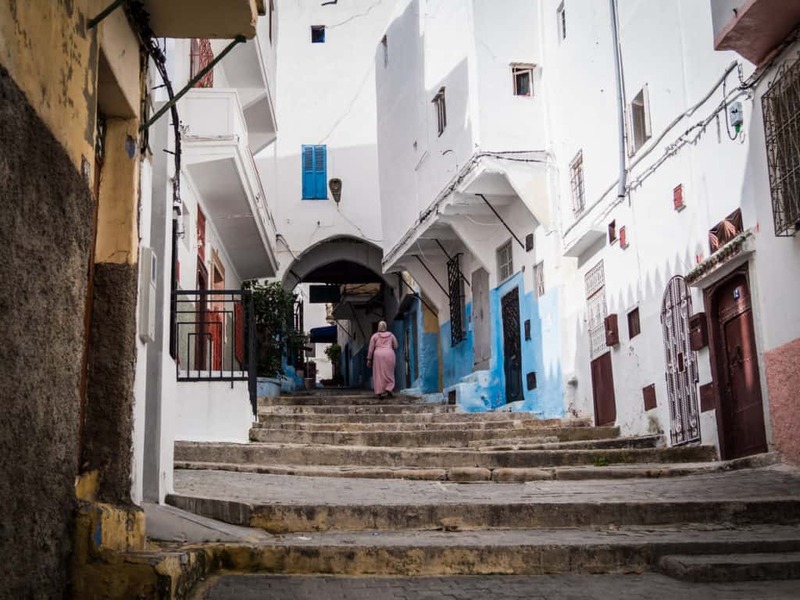 The journey takes approximately 5 h. Once you are in Tangier, you’ll need to take a taxi to reach the old city (see Getting around in Tangier in the section below). In Tangier there are two types of taxis (as everywhere else in Morocco), Petits Taxis (small taxis) and Grands Taxis (big taxis). The Petits Taxis are smaller cars and they are ultramarine with a yellow stripe down the side. They are used to take short rides within the city, charging 50% more at night. Tangier suffers a constant shortage of taxis, so always remember that you can flag down a taxi that already has passengers but still has spare seats left. The Grands Taxis are used to take long rides from Tangier to the surrounding towns and cities or from the airport to the city center. The Grand taxis in Tangier are typically beige colored four-door Mercedes from the eighties without air conditioning. The Grand taxi is commonly a shared taxi in Morocco, the taxi will usually not leave the city before it’s full unless you pay for the entire taxi (all 6 seats)just for yourself. They can be found at the port when arriving by ferry, at the airport, in bus stations, at the train station and at the bigger hotels in the cities. If you wish to go around the city and don’t want to take a taxi, your other option is to take the public bus. The Alsa website has all the information concerning the schedules, prices and bus lines of Tangier. A ticket for a ride on the green city buses costs 3.5 dirhams as of April 2016 and there are plenty of bus stops all around the city. There are two different bus stations that you can use in Tangier to take buses from and reach the neighboring cities. 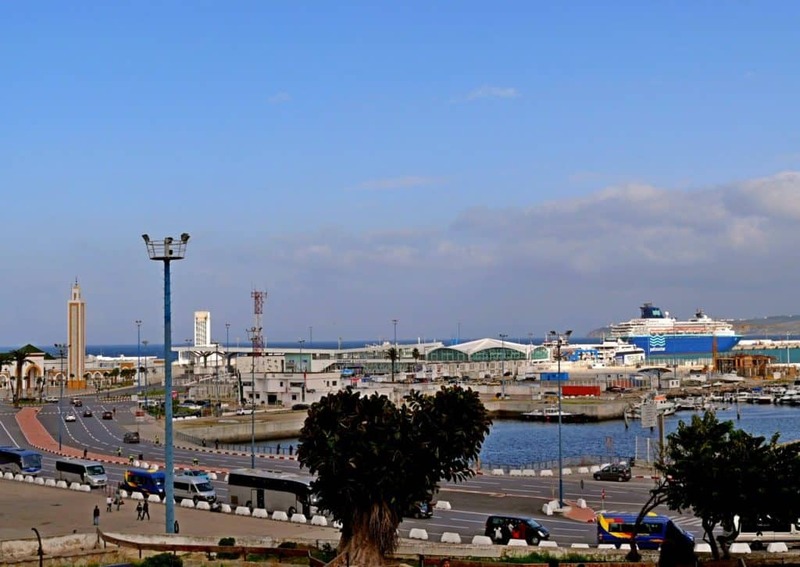 One of them is the main Tangier city bus station, “Gare Routiere” at Place al Jamia al Arabia and the other one is the CTM Gare Voyageurs (new private bus station) on the Route to Tetouan, about three miles from the city center of Tangier. While the first one ( “Gare Routiere” at Place al Jamia al Arabia ) is very central and conveniently located, I would still recommend taking a bus or a taxi to travel the extra miles to reach CTM Gare Voyageurs. I took buses from both bus station and although the prices were almost the same from both places, the quality and comfort of the buses at CTM Gare Voyageurs were of a much higher standard. “Gare Routiere” at Place al Jamia al Arabia is located about 2km to the south of the city center. (see map below). The location is at the following address: Avenue Idriss 1er Tanger Morocco. This bus station can be pretty busy since it is so central and because the buses are slightly cheaper. 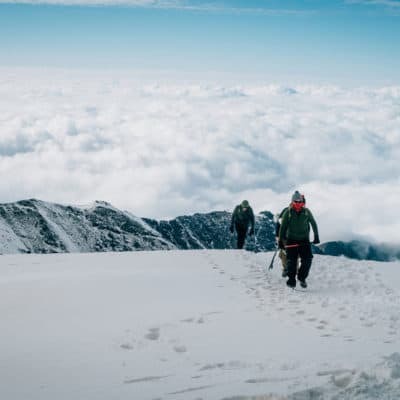 Here you will find a variety of bus companies all offering buses to different parts of the country, it’s also possible to find shared taxis leaving for the neighboring towns such as the shared taxis for Chefchaouen here. CTM Gare Voyageurs is not so conveniently located but the extra comfort these buses provide make the extra mile worth it. The bus station itself is on the Route to Tetouan, about three miles from the city center and directly across Morora railway station (see map below). It is possible to get there by taxi or by taking bus 10 on Avenue Pasteur. 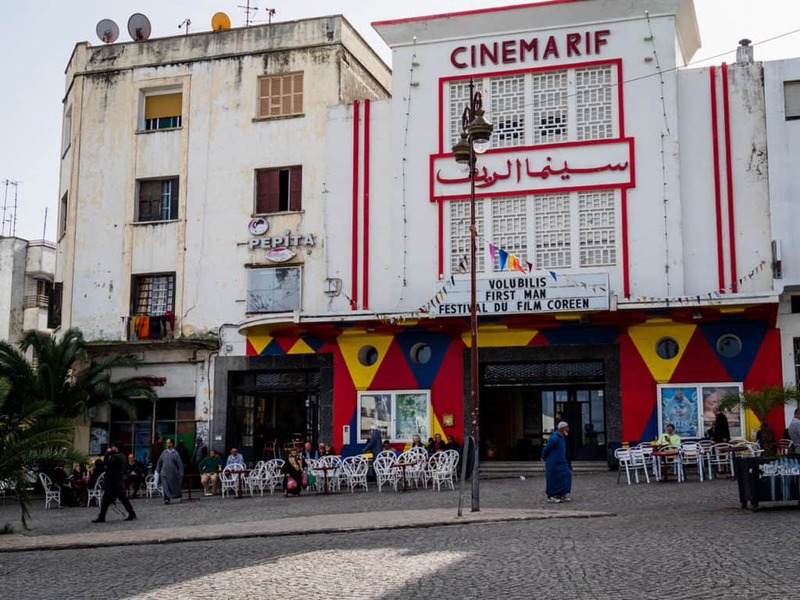 If you want to travel onward to Marrakesh, Fez, Casablanca or any other Moroccan city that has a train service, you will need to make your way to one of the train stations in Tangier. There are two train stations directly in the city, one is called Tanger Ville and the other one Morora however from our experience, Tanger Ville is much quieter and efficient and is definitely the one that you’ll want to get to for trains to Casa, Marrakech, Fes, etc. This railway station has been enlarged to accommodate the new high-speed train and it has lost a bit of its original charm but It’s only about a 7-minute taxi ride from the port making it super easy to be reached from almost anywhere in the city. You can also avoid taking a taxi by taking bus number 13 to the Tanger Ville station, or the railway company’s Supratours shuttle. All the information on prices and timetables for the Moroccan trains can be found on the ONCF website, once you know which train you want, you can head over to the train station to buy your ticket. Make sure to have cash to buy your ticket as it’s not always possible to pay by debit or credit card. 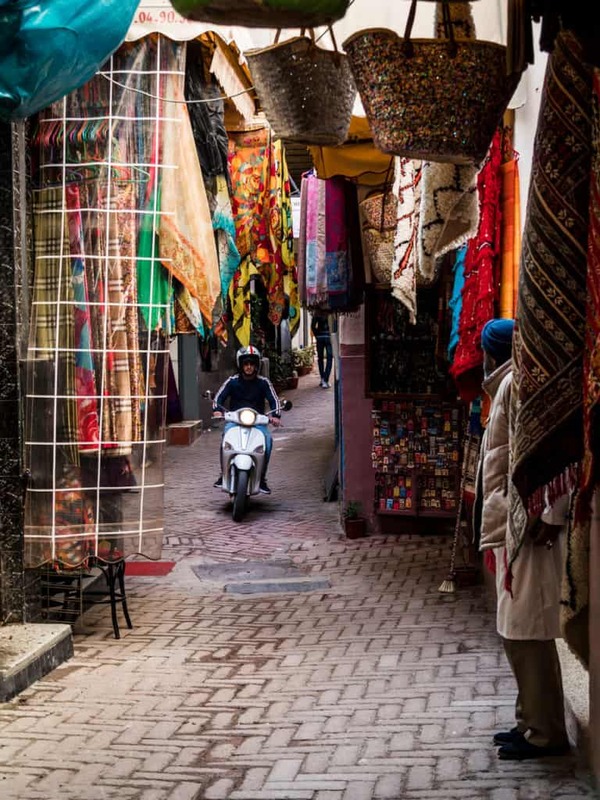 Read: Everything you need to know about Traveling in Morocco! One last tip before I finish this guide. I highly recommend getting your hands on the Lonely Planet Moroccan Arabic Phrasebook. It is packed with all the essential words and phrases you will need on your trip to Morocco and will help you in every situation — from finding a hotel room to ordering tajine or joining the local festivities this book will cover almost every situation you could imagine. I hope this guide was useful to you and I wish you a fantastic stay in Tangier! 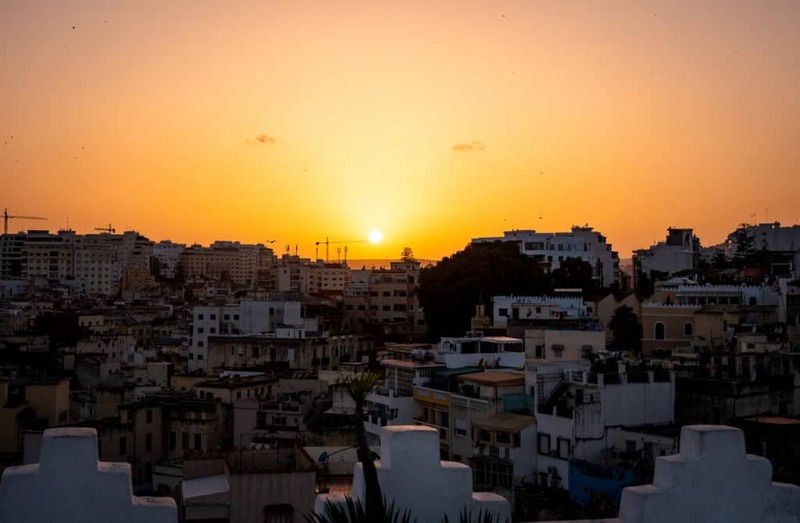 If you have any questions or if you’ve already been to Tangier, we love to hear from you in the comments below! 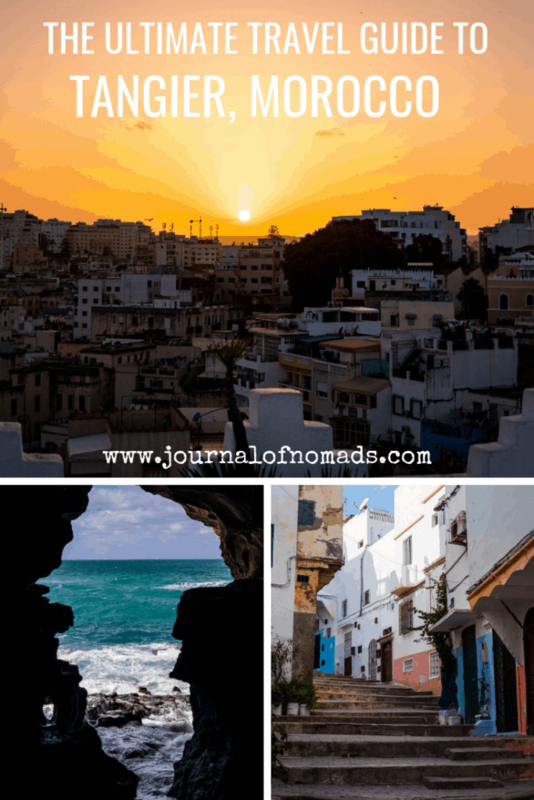 Special thanks to Ruby Josephine for helping me write this guide to Tangier! * This article contains some affiliate links. If you book a hotel/hostel or purchase one of the recommended products through our website, we’ll receive a small commission at no extra costs for you. This way you’re helping us writing more informative and awesome guides like this. Thank you! I’m sure there are a few dance studios near the center. I’m not 100% sure where they are but I would recommend contacting Ruby at https://www.rubyjosephine.com/ She’s been living in Tangier and teaching dance and leading dance workshops there. All the best.